Happy Somerset Day one and all. Hampshire are our opponents today at Taunton on a day when Ireland become a Test nation in more than just name as they take on Pakistan at Malahide. George Dockrell has unfortunately not made the side for their first game but will be there on the radio and we wish all Irish cricket players the best in a hard game. Hampshire at Taunton? Will we keep the momentum going? CC1 match number 4, undefeated and in second place in the table with a game in hand. Not the usual position we find ourselves in at the start of May. Hampshire have not had as good a start to their four day tournament and come to us as possible underdogs. We have been in that situation before and not done ourselves credit so let's NOT take this one as a done deal. 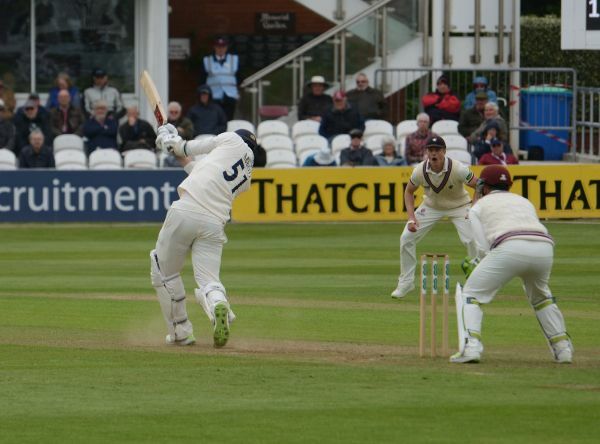 Somerset are not without their problems with Marcus Trescothick sidelined with a broken foot. Eddy Byrom seems to be back in the frame and Tom Banton must be thinking he has a chance after his second team heroics with the bat. Will Steve Davies continue to open after taking the place in the second innings and what will George Bartlett's debut century have done to his confidence? Tom Abell may continue his now 'allrounder' status having performed with the ball in the Lancashire match at Old Trafford. On the rest of the bowling front, there seems to be no sign of Dom Bess in any Somerset lineup after some suggested we ought to consider playing both spinners given the absence of Liam Dawson from the Hampshire side then he turns up and replaces Paul van Meerkenen with Josh Davey still out. Jamie Overton is also still not fit enough for first team action though there are suggestions that he may be back for the one day games coming up after this last CC1 game before the break for white ball fun. Somerset have won the toss and chosen to field first. As someone has pointed out, a strange decision when you pick a two spin attack in early May. They may be expecting to bat only once. Over confidence? Well we shall see as the day moves on. The objective is to maintain the forward motion of the county this season. Our best start for a considerable time needs to be maintained if we are to be a force in 2018 CC1 (which would do us no harm at all). Batting has been better than 2017 but still patchy and unpredicatable with a collapse never very far away. Renshaw has been a bit of a revelation and cameos from Bartlett, Byrom, Abell, Trescothick and even Leach have kept us in games while the bowlers have gone above and beyond yet again to keep us in and this time win matches. Hampshire even see themselves as weak. Somerset MUST not. We have been guilty before of letting sides off the hook or giving them opportunities to get back into games when we really shouldn't. There is no room for this in a championship chasing county. We have players coming in to make their mark and we have others who have shown form. We need ALL of them to get it together, put Hampshire on the back foot and keep them there. 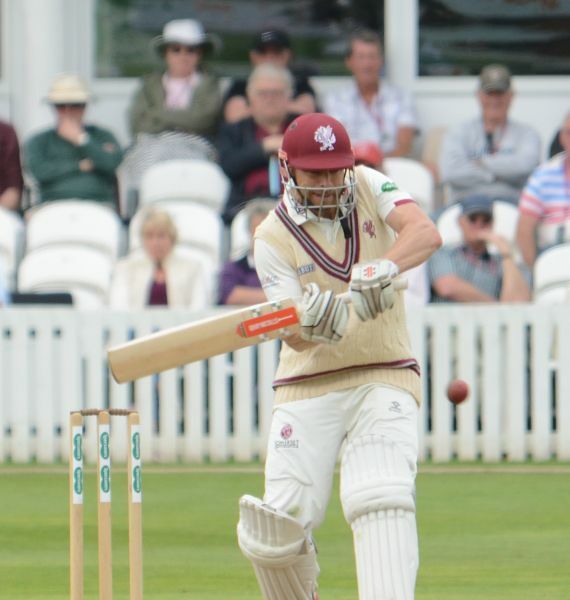 Somerset need the confidence going into the next stage of the season and they need to nail their colours to the mast for the resumption of the CC1 later so other sides see them as a side to watch rather than a side with fragility and the tendancy to take their foot off the gas and lose concentration. That can't be us this year, we've been there too long and have signs that it isn't going to be us in 2018. Good luck boys. Let's start Somerset Day as we mean to go on and turn this into Somerset's summer perhaps. Edited 2 time(s). Last edit at 2018:05:16:10:46:32 by Grockle. Good to see that Dom has appeared and has replaced the Meerkat in the side. Shame we couldn't get them both in but a good decision I think. Eddie Byrom isn`t being given an outing with Somerset Seconds against Glamorgan Seconds at Taunton Vale today, so it look as though he may not be fit enough yet to be considered for tomorrow`s championship match with Hampshire. Dom Bess, who took wickets and scored runs against Surrey Seconds on Tuesday, isn`t included either, so he may be preparing in the nets at the County Ground. Hampshire are giving late tests to wicket-keeper Lewis McManus and Liam Dawson, both of whom suffered thumb injuries against Notts at the weekend. One of their `finds` from last season, all-rounder Ian Holland made his return from injury for Hampshire Seconds this week but didn`t bowl, while Italy ODI international Gareth Berg was also back in action. Edited 1 time(s). Last edit at 2018:05:10:18:29:47 by Grockle. Gareth Berg is an Italian international!? Squad for the Hampshire game. Davey faces a fitness test. Tom Abell (c), George Bartlett, Eddie Byrom, Josh Davey, Steve Davies, Lewis Gregory, Tim Groenewald, James Hildreth, Jack Leach, Craig Overton, Matt Renshaw, Paul van Meekeren. The Somerset County Gazette has a free entry voucher to any one of the four days as part of Somerset Day celebrations. Looks to be as simple as cutting it out and taking it to the gate. Applies to the Hampshire game only. Dont tell Hampshire fans that. At £18 on gate could cost the club £100 or even £150 in lost ticket sales! No Dom in the squad. Not in 2s either today, fishy!? Seems a little odd to me naming the squad with all our injuries and the seconds playing today where someone may shine and warrant late consideration. Also Bess not involved in either the squad or the seconds - injured? Very disappointing if Dom is really not in the squad. Then again, the website has form for getting this sort of stuff wrong - remember they didn't even have the correct starting XI listed at Old Trafford (even though Beeb, Cricinfo etc did have the correct information). There are also only twelve names listed - do we usually name only 12 in the squad? Can't see Davey being worth the risk if his fitness is sufficiently in doubt as to merit a test of it. Edited 1 time(s). Last edit at 2018:05:10:16:20:04 by AG on apple. Several times in past years players not named in the squad have made the match day XI. I would be most unsurprised if the team see's Eddie in for Marcus & Dom in for Paul, lets see at 10.30am. Liam Dawson not fit for Hampshire, but `keeper Lewis McManus, who injured a thumb at Trent Bridge, is in their squad, as is Mason Crane and Gareth Berg. All a bit odd re Dom Bess. Any news re Jamie Overton’s injury/recovery ? Overton, J has another sick note I am led to believe. Not fit yet anyway. And if he were, would he be risked to play? Any proof Tom Seymour or just another case where you are looking for a response? Also, WSM fan surely Jamie will have to prove his fitness in the 2nds before he is considered for first team selection in 50 over competition. Don’t want to be rushing him back at the risk of him breaking down again. Take it or leave it Cleavo, and if I were "looking for a response" I got one from you didn't I? Overton, J "breaking down again", where's your faith Cleavo? People tell me he is going to be a World beater! Anyway... Another vague weather forecast for this weekend, band of rain about 5pm tomorrow might not amount to much, then showers possible sat and sun. Simple question to your first post really Tom, which I got no answer to. Any proof? Reliable source? Never mind all irrelevant really as club physio and management will make their own assessment. The “breaking down again” comment was some words of caution from myself given Jamie’s injury and fitness record. Anyway back on thread here’s hoping for a good 4 days v Kolpakshire/South Africa B weather permitting before the first break for white ball cricket. Lalala, WSM is a hotbed of information! Quite often bowlers not playing are out practicing at the lunch and tea interval. I assume you will be there all match Tom so maybe you could ask Jamie or one if his team mates (Craig!?) in person. In my experience none of our players bite and are all extremely friendly if you are polite to them and ask questions. Same goes for Andrew Andy & Jason. I am nobody important but do my research and obtain facts not wild speculation and false rumours. Whoever your source is that suggests Jamie is injured again i suggest you serve him his P45. Edited 1 time(s). Last edit at 2018:05:11:00:29:40 by wsm fan. Unfortunately, he will already have missed 28.5% of the CC season by the time the Hants game is done with. That leaves him a maximum of 10 CC matches left to play this season. And, really, the smart money would be on him playing no more than the 6-7 games a season which has been his recent average. After all, even IF Jamie is fit for all ten games, it would seem highly unlikely that it would be prudent (given his history of back problems and role of bowling fast) to just pick him for game after game, given that they are packed in tightly, with little rest in between. Edited 1 time(s). Last edit at 2018:05:11:07:35:16 by AGod. The next 5 are very spread out! If he is fit, he is a variation. I have no problem with using him sparingly as a shock and awe option. It's when he's most effective and given Tom A's new job we don't have to bowl him to death. I'm up to adding something else to turn to. If he were not injured then he would be available for selection which he is not. Simple! Simple! So disclose your facts. If you can't let it rest. Cleavo says "The “breaking down again” comment was some words of caution from myself given Jamie’s injury and fitness record." Surely that is a contradiction coming from you Cleavo. And no, I won't be there for all 4 days, wsm. Tomorrow I shall be watching Somerset but at Rugby Union. Rejoice! Yes he has been injured as reported but is now fit. You said he was reinjured which is as usual false. Aa i say ask him or his brother today and im sure they will update you in person. But then why let facts spoil a false rumour hey! Bit of an odd decision to field given team selection, no? True - unless they expect to only bat once? More confidence than I have if that is their thinking. More often than not, Taunton gets flatter and there's often little or nothing there for the bowlers on day four. So it's usually better to get all of your bowling done within the first three days, IMO. Will this track follow that pattern? Who knows? It does sound deliciously dry, this surface, which I'm delighted to hear. Tom Seymour - how do you know that Jamie is not available for selection? It's now conceivable that he is both: a) fit and b) not selected. It sounds as though we've failed to bring our usual discipline to our bowling this morning? Too many four balls. Far too much in the 'short and wide,' or too straight categories at the moment. One of our poorer bowling displays, as a unit, for a long time, I'd say. Time, soon, surely, to see if the spinners can provide rather more accuracy and discipline to proceedings. A good ball from Tom.............. *now* can they find the requisite discipline after the boost of a wicket? Sadly, no signs of any turn at all for Leachy, thus far. So we are likely to need a drastic improvement from our seamers before/after lunch or we may find ourselves in a very uncompetitive position in the match. Well done Tom - main strike bowler! We've given away far too many runs BUT if we could get the prize wicket of Amla before lunch, then we'd take a lunchtime score of 125/4 or so, with Amla in the hutch. Jamie in full bowling workout at lunch. Flying in come the end. I wouldnt fancy facing him! No sign of you introducing yourself to him though Tom. Shame. I took a photo incase you missed it! Well, I wonder if there's any chance of him playing at the Oval next week? Under Maynard we seemed to rotate quite a bit in the 50 over stuff (bowling wise). Will Jason decide to continue in that vein? With Lewis, Craig and Tim having played all four CC games to date then I'd have thought a case could be made for a bit of a rest, especially in the case of LG. Great wicket first ball after lunch but the 4's have started flowing again. Yep, nice present from Hash, but then some more poor short stuff. ... There's no logical reason, really, to believe that either Josh or Paul would have produced better figures than Tom has today. I can see no reason to believe that Josh would have produced better figures than Tom did at Old Trafford and Paul, factually, did not do so. That's not to say that Josh or Paul don't have a role to play, but I think it should be filling in for/rotating with the "3 main seamer" roles in the team. There was talk, during the last game, that Jason Kerr has been very much on Tom's case to make more of his bowling ... and doing so looks like it was a very good move on Jason's part and Tom has responded to his entreaties quite superbly, thus far. Tom looks as though he has probably worked, extensively, on his bowling over the winter.. it's not just one yard but two that he seems to have put on.. and he may well have worked on swinging the ball, too. Edited 1 time(s). Last edit at 2018:05:11:16:18:27 by AG on apple. Gregory, an Overton, Groenewald and Abell, plus both Leach and Bess. It's a huge bonus, having six proper bowlers, with the captain always having the option of another, similar type of bowler to turn to if someone's not having a good spell. Which appeared to be happening quite a lot while I was there this morning. I've seen too many games against Hants at Taunton where a procession of Hampshire strokemakers have feasted on an out-of-sorts attack. It's been such a relief to see a Somerset captain have the resources to nip that sort of thing in the bud today. So the fitness of Jamie at the moment is an irrelevance because until he shows some form he would not probably get into this side except as a rota bowler. Unfortunately I very much doubt there'll be any more play today as where I am in West Devon it's being raining very steadily since lunch time (and poor Ireland, further west still, had their whole first day rained off), so it looks like there's a very solid, or rather liquid, belt of rain moving up from the West. Forecast for tomorrow would appear to be dry if none too bright so hopefully there won't be too many hours lost. 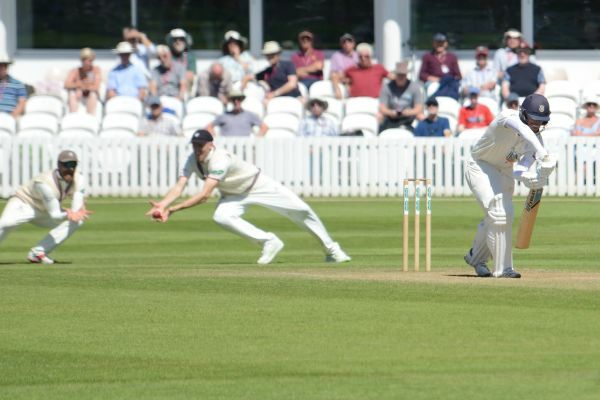 Lancashire's decision to go to Trent Bridge with an all-seam attack and an extra batsman seems to have been pretty well vindicated, as does Alex Davies' decision to take the Renshaw route. Tom Abell`s current 3-18 at Taunton has lifted him to the leading bowler in the land - or at least top of the Division One bowling average. He has claimed nine wickets to date for 74 runs (average 8.2) and has moved above Yorkshire`s Steve Patterson. There are still four Surrey wickets for Patterson to take at The Oval, but as his figures are currently 2-61 he will struggle to switch places with Abell again. Not to mention, of course, that there are still two Hampshire wickets on line for Abell to snare. Strange we're off for rain, from the Taunton webcam it looks sunny. Only saw the morning session (plus Amla’s dismissal) today. Our bowling was somewhat mixed, albeit Tom’s continues to be a revelation. Better not take too many more wickets Tom, you’ll get yourself on England’s radar ! Come to think of it, in a four day game, I reckon SCCC would I give England some pretty stiff competition right now. The word is Jamie Overton will be playing in the seconds match next week, ready for when the fifty over cricket start. Dont believe it Mike, all lies! Tom has already written him off for the season! He looked remarkably fit to me for a crocked injury prone liability who is unlikely to play again this season but hey what do i know. Test squad announced on Tuesday so every chance Craig & Jack will be in a 13/14 at least. There will be spaces up for grabs and indeed likely rotation in the 50s as i believe the 8 matches come in 19 days so with Jamie Josh & Davey to mix in we look to have plenty of options and the chance to rest Tim & Lewis if we wish too. As for today, not our greatest biwling display, but no luck either. Renshaw dropped a sitter off Timmy G. Lewis had a muscue land just over slip cordon, numerous play & misses and a few leading edges off spinners. All out 170 wouldnt have flattered us despite not being as tight as we normally are. Roll on 11am for a nicer day for batting and no spinner in Hampshires 4 man attack. Bright sun now in Tavistock, so hopefully the belt of rain is fairly narrow and we can get going again at 11 without having to wait for the outfield to dry. Looking forward to some good stuff when I get back on Sunday, and maybe even Monday (if not wrapped up by then). 8.2 quite right CJM, not 8.4, I miscounted. If Jamie is close to match fitness that is excellent news. I'd give him a run or two in the 50-over competition, but certainly wouldn't see any need to play him throughout as this is surely the form of the game where he is least liable to be effective. Not to mention that the Championship is the one we most want to win. Yes, wsm, I did see Overton, J having a workout at lunchtime today. If he is fit, and more importantly fully match fit, good luck to Somerset in selecting their next team. I am not sure they will risk him too soon. It was an interesting day's play. Gregory was poor to begin with and Overton looked anything but an England player or contender, bowling too much short pitched dross and giving away what seemed to be too many fours. But the team stuck at it and thanks to Abell got their fair reward. Very bad miss in the slips from Renshaw. Could be an interesting days play tomorrow. Won't be there to see it, so I look forward to a series of true and, more importantly, objective reports. Great start by Somerset. Someone has already said it, but the selected eleven is IMO our best starting eleven. I have always been a two spinner advocate, and particularly because our two are, possibly the best pair in the country, they would be the first two names on my team sheet, followed by the skipper. His antics with his little seamers reminds of the days when we could call on similar type bowlers - Bill Alley, Tom Cartwright, Budgie Burgess, Keith Parsons and probably others I have forgotten. As the fourth seamer Tom fills an important gap and makes it easier to always play two spinners. Of course we won't know how good Hampshire's score is until we have had our turn. The new management team are certainly hitting all the right buttons at present. Reading between the lines, it appears the England selectors may be tempted to row back from major changes - still pushing for Ali rather than Jack? IMO the major threat to Ali's spot could be Dom eventually. The last county match for a while started today, with both captains getting what they wanted, Somerset wanted to field and Hampshire wanted to bat, I wonder if the Hampshire captain may be thinking Somerset knows their pitches better than we do. I didn't think we bowled as well as we could have done at the start, too many balls off line, in saying that there were good balls from all bowlers some of them should have got wickets. No dramatic photos today, so I have picked some of the best. Kyle Abbot decided to attack Jack Leach by going down the pitch to hit four runs. Lewis McManus also decided to attack by stepping down the pitch to Dom Bess to hit this six runs. People are beginning to ask who is this bowler called Tom Abell, James Vince must be asking the same question after getting an edge to the wicketkeeper Steve Davies. Jimmy Adams can only watch a good bit of fielding stopping him from getting runs. Hampshire also had more luck when uncontrolled balls were hit in the air and landed safe between fielders. Finish Hampshire off in the morning around 200, and pass their score by mid-afternoon. ... Won't be there to see it, so I look forward to a series of true and, more importantly, objective reports. Will you be able to recognise objectivity Tom? You can spell it seemingly but it isn't usually something you yourself are familiar with on a regular basis. While on the subject, please don't go any further than suggesting that people on here are liars or reading them will be about all you will be doing in the very near future. Or can your final paragraph be read in some other way? Edit - sentence now makes sense. Edited 1 time(s). Last edit at 2018:05:12:10:31:27 by Grockle. I am always objective Grockle, and you can read my final paragraph however you wish without any further clarification (though I do not see it as being needed) from me. 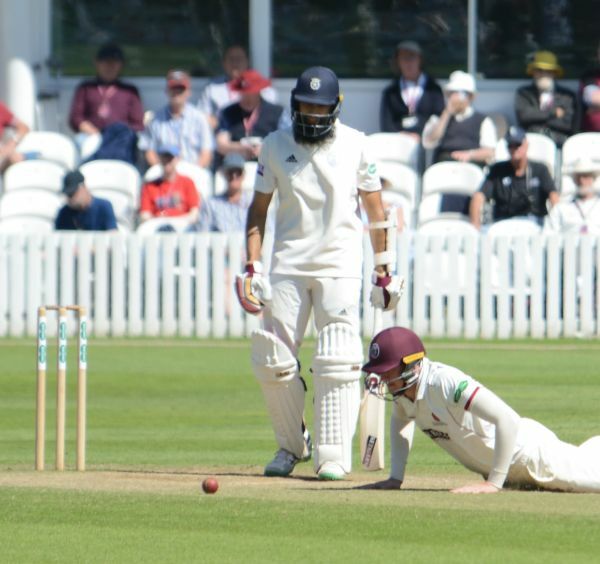 And so Somerset started the match against Hampshire in second place in the Championship table, 17 points behind Nottinghamshire but with a game in hand. As far as such a thing can be said so early in the season they have their Championship future in their own hands. And such young hands. Only three of the side that took the field were over 30. The rest all under 27, six under 25, three aged 20. It would be a phenomenal feat if such a side could challenge for the Championship, let alone win it. They added to the pressure on themselves by selecting a side tailor made for winning the toss and batting, then won the toss and put Hampshire in knowing Hampshire must have wanted to bat first. Perhaps looking at the cloud above and the grass on the pitch below. Perhaps thinking, as someone said to me, of the Taunton pitch’s propensity to flatten towards the fourth day. Perhaps all three, and possibly more, for such decisions are never simple, simplistic or as easy as they may sometimes seem from beyond the boundary. Inserting a side on winning the toss immediately puts pressure on the bowlers. It is one thing to have the responsibility of bowling when the opposition has elected to bat and the expectation is of runs to come. Quite another to choose to put the opposition in and then have to deliver on the unspoken promise of wickets to come. I have often wondered if this is one of the factors, among many I have no doubt, which contribute to what the tide of history suggests is the failure of so many decisions to insert. Indeed, Somerset have been twice inserted by the opposition at Taunton this year and twice the opposition have lost. Overton started well with two maidens but, switching ends to replace Gregory at the Somerset Pavilion End, did not look as threatening as he can. He had a tendency to overpitch, perhaps in pursuit of the movement an insertion demands. Eventually Vince took advantage to the tune of 12 from an over. Tim Groenewald, a brake on scoring this season, had replaced Overton at the River End and quickly found the edge of Weatherley’s bat. The ball flew to where the quarter-century experience of Trescothick’s midriff should have been and Renshaw put the catch down. “What a gift that was,” someone said. Groenewald, Somerset’s oldest player at 34, persisted and pushed as Hampshire took advantage of any youthful waywardness, until Adams edged to the keeper and Hampshire were 44 for 1. Abell, Somerset’s unexpected strike force this season, replaced Overton as Hampshire started to attack Groenewald with some success. The runs were coming at over four an over, the score was rising towards three figures and the lessons of history must have been ringing in Tom Abell’s ears. Abell may make history himself one day and he certainly has the capacity to shape it. Here he started to shape the Hampshire innings. As it seemed to me he ‘wobbled’ a ball through Weatherley’s defence, found the pad and it was 86 for 2. That brought Hashim Amla and the experience of over 100 Tests to the crease to face Abell and Jack Leach, who had replaced Groenwald at the River End, with one between them. It was Vince though who lead Hampshire’s charge. He hit Leach for two fours and Abell for one but Abell went through his defence twice. Then Abell moved one away late from Vince, the ball took the edge and Davies took the ball. “Oh Yes!” drooled the man in front of me well before the umpire had raised his finger. It didn’t look quite so sumptuous as that first legitimate ball of Gregory’s but it was essentially the same delivery and deadly. 105 for 3 and 111 for 3 at Lunch. On my customary lunchtime circumnavigation of the ground the general view was that three wickets before Lunch was a reasonable return for putting a side in. My bones were telling me Somerset really needed four given the pitch and the conditions and Hampshire had perhaps twenty too many runs. Whether it was history or young Abell that was right about the decision to insert still hung in the air. Stopping at the kiosk next to the terrace at the top of the Somerset Pavilion en route to my seat I missed the first ball after Lunch. I didn’t miss the huge cheer that accompanied it. “Who was that?” I asked the person who rushed by from the terrace. “Amla!” he smiled. “Strangled.” Groenewald had lodged a reminder that the older generation still had a part to play in this team. One ball late, but I might have settled for 111 for 4 at Lunch provided Somerset were able to push on. As I looked beyond the Trescothick Stand the point of the Quantocks was developing an embryonic shroud of slight rain. Some way to the east of the ground the sky was coated in a film of the smoothest silken silver-grey cloud that often presages the onset of steady persistent light rain. Neither was an immediate threat but both hung in the air like the question of the wisdom of the decision to ask Hampshire to bat. 111 for 4 could go either way but it was an uneasy feeling. Now the two generations of Somerset cricketers worked in tandem. Groenewald hit Rossouw a nasty blow under the heart, both he and Overton went past the bat a number of times and Overton had what looked from 100 yards a particularly good lbw shout. Rossouw and Alsop counter attacked for Hampshire although in the process Rossouw gloved an attempted hook against Overton at catchable height through the out of fashion leg slip position. Once again Hampshire were pushing Somerset back as they moved past 150 still four down. History and Rossouw, who was scoring freely, were beginning to get a little shrill with their questions about the wisdom of insertions. Somerset answered with Gregory who replaced Overton. Wayward in his first spell, better in a short spell before Lunch, he was now transformed. He whistled past the left-handed Alsop’s outside edge, then found his inside edge and the ball hurtled towards the stumps, upending the leg stump on the way through. 165 for 5. Bess meanwhile had come on at the River End and although I could not see the ball pitch from my position he had found a hint of turn in an earlier short spell from my end. However he did it he induced Rossouw to pop the ball straight to Leach at cover. 178 for 6. Somerset were working their way back into the game and becoming more chirpy in the field as they did. The Somerset crowd does not chirp but it does buzz and it was buzzing now. Gregory had found his touch and was really hounding the batsmen with one of those spells that makes you wonder why a wicket does not fall every over. With Bess on at the other end, Leach warming up, Groenewald and Overton taking breath for another charge and Abell seemingly always on hand to take a wicket at the drop of a hat I did wonder what the batsmen were thinking. With six front line bowlers, Gregory with his testing movement when he gets it right, Overton with his lift and accuracy, Groenewald constantly homing in on the off stump, Abell fizzing it through and moving it late, Leach turning it one way and Bess the other batsmen must sometimes wonder just how far down the season the light at the end of the tunnel is. That kiosk next to the roof terrace of the Somerset Pavilion is a real nuisance. I only went there twice today I promise you. This time Abell took advantage and this time Renshaw held the catch. McManus the sixth Hampshire batsman to get a start and not go on. And then Gregory, now bowling as he can, trapped Berg lbw. 198 for 8. And that was it, for that innocent looking silver-grey cloud was now enveloping the Quantocks and sprinkling just enough rain over the ground to send the players off and most of the rest of us home. As to that question posited by history it is still unanswered as far as this match goes. Whether Somerset did enough in the afternoon session to outweigh the runs scored in the morning session and to justify the decision to insert only the second day can answer. Somerset may have to work harder than they might have done to establish an ascendancy in this match. They will though have added some valuable lessons to their fund of experience which will pay dividends for years to come. And, let us not forget, when Somerset come out to bat numbers one, two, three and five will be aged 22, 20, 20 and 24. Edited 1 time(s). Last edit at 2018:05:12:04:04:59 by Farmer White. Fine Tom. I agree with you that the interpretation is pretty clear but I did provide the opportunity. On the basis of your answer I will warn you to be careful if you wish to post here on a long term basis. Clear enough? Edited 1 time(s). Last edit at 2018:05:12:04:37:56 by Grockle. If we can just bat time they could be in some trouble! Berg a nagging medium pacer who could bowl long spells but just back from 3 weeks paternity leave. Got to bat properly of course but a very risky policy especially given we have selected 2 spinners which shows we view the pitch pretty differently to them too! We have to watch the 'Taunton effect' where a player with no recent record has his great day of a season playing us here. Other than that, if our batting holds together we can be in a good position at the end of today. Only having to bat once would be very good but Dom got some stuff on Day 1 so use him and Jack when they bat again if necessary. If Lewis and Tom get movement and Craig comes to the party in the second innings (he tends to have a good innings in a game) then we have a chance with this one. We just do not need to give Hampshire the upper hand through our own fragility. I have no problems with a side earning it, I would just like to see us make them do that more often without our help. I wouldn't, necessarily, infer from our team selection that we expect anything out of the ordinary in terms of turn, WSM. We may simply have decided that picking our best XI players is the best policy *unless* conditions are significantly out of the ordinary. We've almost certainly decided - and with good reason - that Tom is a very handy fourth seamer. I suspect that Old Trafford will have cemented that in the minds of Jason and Andy (and perhaps Tom himself). After all, Tom got far more swing than Jimmy did, up there! After Tom's performance in the Worcs match, there may still have been a feeling at management level that Tom was a good option in helpful conditions, but perhaps less so if a track is flat. Old Trafford will have dispelled any such notion. One can also say that it's unlikely that we are expecting the track to deteriorate, otherwise we would surely have batted, upon winning the toss. Incidentally, it's a nonsense to have a toss in that situation - once Hants told us that they didn't want to bowl, that should have been the end of matters "That's fine with us, let's get on with the game." Edited 1 time(s). Last edit at 2018:05:12:08:10:35 by AGod. So far as today concerned, my feeling was that most of the help for the bowlers seemed to me to come through the air, more so than off the pitch. Help through the air for bowlers is, of course, something of a mystery (whether it will happen on any given day or not). In which case we might be fortunate and find that there is less of it about today (or indeed there could be more). The pitch itself may be slightly less green so what help there was off the pitch should diminish a little today. All that being said, if I had to guess what will happen today, then I suspect that both sides will total about 225 in the first innings....and then I hope to see Jack and Dom lay waste to their second innings, to leave a very gettable target, with some of that innings taking place on a dead final day track. We havent played 2 spinners for no reason! I'm sure we always have reasons for picking a team, WSM. But that reason may very well be 'Dom's a really good bowler and, with Tom in the team, we already have four seamers anyway,' more so than "Golly gosh, we're expecting this to do plenty." Once you've made the determination that Tom is a quality fourth seamer, then that means that the only real remaining choice would be either to pick Dom OR to add an extra batsman of some description (Tom Banton?). Edited 3 time(s). Last edit at 2018:05:12:08:49:25 by AGod. I never said play a 5th seamer. A batter a logical option if we didnt tbink it would spin. I am glass half full and have been most impressed & surprised with Tom's bowling. But as he says himself lets not get carried away. A very useful option but he has taken 9 wicket in april/may with brisky medium, not 49 on flat ones in August. He needs to be a welcome addition to our attack for me not taking the place of a main seamer. All based on conditions clearly. This match he is fine in a 6 man attack as 4th seamer. 104 over day and sun is shining, Hamps are in dodgy form, lets ram it home today chaps! Viz Tom; We have to see how well his body will stand up to bowling, I grant you. But so far as Tom taking wickets on flat tracks... was Old Trafford not flat enough for you!? Tom 4-0 Jimmy (first innings)!! As for something potentially even flatter in August? I think we'd be certain to pick two spinners on any such surface - I can see that Tom as one of only three seamers would *not* be ideal in that situation....... but I think that, on such a surface, the make up of our team would be the same as for this match (with Tom as 4th seamer). I wouldn't expect us to make the same mistake that we made at OT again (only one spinner on flat track). A question might arise on a Ciderabad track, if Jason did want to pick three spinners. Would we be happy with Tom as the third of three seamers in that circumstance? Edited 2 time(s). Last edit at 2018:05:12:09:35:23 by AGod. I say again a most welcome useful extra option. Time will tell if he is a 10/20/30 wickets a season man. If he can keep nicking wickets here and there and biwl even 6/8 a day to help manage a full days bowling then great. He has 5 balls this morning to mop up these final 2 rabbits! He has also given us back what we lost to some extent as Pete Trego lost that edge with the ball at CC level. I hope that also means we can keep Pete's edge intact for the shorter formats rather than demanding an over taxing workload from him in past seasons that he manfully tried to provide. Can’t help wondering whether Tom Banton would have been a better choice than Eddie for this game. Anyway, now would be the perfect time for James to show everyone what he can do. Edited 1 time(s). Last edit at 2018:05:12:12:35:12 by Grizzzly. Banton would have been out to that ball from Edwards too. So would Tendulkar, IMO. Not much can be done with a late in-ducker at 90mph! (Yeah I know Banton and Sachin are RHBs but I mean if they faced an equivalent delivery for them). We may struggle to get up to their total (depending, substantially on what Renshaw does) but, if so, then the blame will lie with yesterday's poor bowling performance, IMO. Surely, Agod, it is substantially what Hildreth, Abell and Davies do, too. And maybe Gregory and Overton and Leach. We may not struggle at all. But, we may. It is all in the lap of the Agods, I reckon. Appalling judgement and execution from Tom there. Very poor situational cricket. The ball was too far outside off for a shot like that at that stage of an innings (just come in), to say nothing of the timing just before lunch. So it was poor judgement on two counts. Edited 1 time(s). Last edit at 2018:05:12:13:06:26 by AGod. It's all going a bit wrong - Abell out for a duck. I'm afraid the paucity of our bowling display yesterday (not consistent or disciplined) is coming home to roost now. Hildreth has now been dropped SIX times this season, already. Unreal. Yep. We can't compete if we can't bat in our first innings. Somerset are still relying on one batsman per innings to have a good day. We are still lacking consistency in any real way and hoping someone stays in and then the bowlers bring us back to a game. It simply can't happen every game if we want to be seen as credible Championship contenders. 80 odd for four at lunch. With a lot of swing available, then one imagines that this pair will need to bat for a considerable period of time such that, by the time the fifth wicket falls, the ball will have lost its shine and stopped swinging. Because batting may very well be very tricky for numbers 7 downwards against a bowler of Fidel's pace with the ball hooping around. Edited 1 time(s). Last edit at 2018:05:12:13:12:08 by AGod. It seems our short balls went for 4, theirs are steered in the air directly to a fielder! But - as you say AG - very very poor judgement to play the ball at all just before lunch. Edited 1 time(s). Last edit at 2018:05:12:13:14:19 by Rod1883. [quote AGod]Appalling judgement and execution from Tom there. Very poor situational cricket. Maybe he should stick to two roles in the team rather than three. Poor bowling yesterday, and poor batting so far today. It has always been in our psyche, and so many people in the past have tried to rectify it without any marked or long - term success. Another disappointing season I fear. Much has made of the Hampshire lack of bowlers and so their inability to sustain the attack over a long period. It's not an issue for them if we're going to lose/throw away wickets at the of one every 5 overs or so! Well, Clarence, I imagine that Jason may be invoking the 'spirit of Leachy from OT,' over the lunchtime pasta or salad, and I think we shall need it. Unless Hildreth and Davies can bat for a good 30-35 overs so then seven downwards will need to show all of Leachy's skill and fight from OT in order to get us up to the sort of total that will be competitive. This is now Somerset's to lose with the loss of Abbott- the difference between certain relegation and having a hope in hell. Somerset should get a decent lead from now on and win against a three man bowling attack. A dreadful morning for Hampshire to lose Abbott, defending a small first innings total. I wouldn't put too much money on that outcome if I were you, Hants 01. Three seamers and Vince will be plenty if you take all ten wickets inside 60 overs or so.. and I'm afraid there's every chance that that will happen. Really have no idea what Tom was thinking before lunch. That daft moment used up a few brownie points he earned yesterday with the ball. Everything to play for here. Just need someone to apply themselves for a period of time. Yes, that key word *application* - it is most often that commodity which separates CC winners from also-rans, IMO. Well as by this time last year you were confidently predicting relegation Clarence I can only assume that a 'disappointing' season for you is anyone where we don't win the CC. My you have been disappointed in the past. Many times. It's a bit early to be 'disappointed'. Though I suppose you managed a month from where you started being disappointed last year.... progress? I doubt you see it that way. The rest of us though? Well I for one am looking forward to seeing my first English cricket in a month's time and I am certainly not yet disappointed. Having won 2, drawn 1 and with this one in the balance and really for us to lose I'm personally quite optimistic at the moment. Sorry the world hasn't really changed for you though. Here they come, popping out like the daffodils in spring, the bearers of doom before the innings is half over. Fingers hovering over the send button anticipating every wicket. It makes i chuckle. .
Oh and sitting in the lower tier of the new pavilion in scarf and coat i wonder what Farmer White makes of the incessant round robin clapping of the Hampshire fielders. While in no way giving up yet Nailsea.... it does get bloody boring being in a position to do something and then watching our middle order wander out and wander back again first innings after first innings. Then there is the praying that SOMEONE manages to get their bat in gear and that the tail wags again. We are lucky we have a tail that does to be honest. I thought we might be getting there and we may yet. However this is another Taunton game with another three out of 6 adding 11 in the first innings and James or Tom or Matt or Steve or Lewis or Jack or Eddie or George or Craig having to take more of the burden and sort out the collapse whether it is minor or major. The only batsman that has had a consistent season where he has scored more than failed is James Hildreth and that was three seasons ago? Dean did it last year (Thank Heavens). Nick did it a few seasons ago. Marcus used to do it over five ago but not in recent years (half a season maybe) Eddie, George and Matt are too recent. Tom hasn't, Steve hasn't, Lewis hasn't. That core has to get stronger. Three or four in the top 6 have to stand and be counted rather than waft and be hopeful. THEN we would be a championship side to chase. We have such potential and we are seeing more of that this season BUT we still throw too much away and fail to serve up hard stuff on a regular enough basis. It depends on luck far too often - we are just getting more of it at the moment. We need to make some of our own. But...... take the luck when it comes and keep on working. I'd just like a game or two where the top 5 pass 40/50 AND the tail wags. Davies retired hurt with an injured foot? Hopefully not another broken metatarsal? edit: Gregory didn't last long!!! Edited 1 time(s). Last edit at 2018:05:12:14:53:41 by Rod1883. We have lost a player injured in every match so far this season. I thought Tom Banton would be picked for the white ball stuff anyway. He certainly will now..
Gregory is, I'm afraid, ripe for a demotion in the batting order. Anthony Gibson intimating SD has a back injury, albeit he appeared to walk off unaided, without any obvious sign of pain. Unless it is a bad injury, certainly hope he can resume his innings later, perhaps with a runner. No idea who would keep wicket for us in the second innings, if SD can’t do so. Perhaps GB or EB ? Really disappointed with Lewis’s batting this season. He has the ability to comfortably average 30+, yet no sign of anything at all this year yet. We are still very much in this game though. Edited 1 time(s). Last edit at 2018:05:12:15:10:03 by Grizzzly. Good job Tom has started to bowl - though that is assuming that he gets some runs as well. Have we sorted Lewis' contract yet? What's happened to Abbott, and to Steve Davies? Ankle Abbot. Foot Davies. According to the BBC and the Somerset website. A second successive very good batting contribution, at a time when the team was under the pump, from Craig Overton. Agreed AG - might even get a decent lead on first innings with a bit of luck ! Simply superb batting by these two! Well played James Hildreth and Overton. More to come? Well played Hildreth, great ton, and of course Cove in support. I knew that my praise would hex Craig Overton. Well, 89 ahead with three wickets remaining is a position we all would have taken at the start of the innings I'm sure. It looked a bit dodgy for a while but Hildreth, Cove, Davies and Leach have turned it around. Push it past 350 tomorrow (is 400 too much to hope for?) and then put some real pressure on their batsmen. Once again a batsman stands up (it has happened more this year) and the tail has stood with him once again. Well done JH plus Craig and Jack. Excellent end to the day. Edit - that didn't last long, 11 balls and 4 runs added. Edited 1 time(s). Last edit at 2018:05:12:18:34:02 by Rod1883. I think we'd have all settled for that at the start of the day, even if Somerset did seem to make hard work of it when they batted. Nearly a hundred lead, three wickets still to fall. You'd have to think that a lead of over 100 would put all the pressure on Hampshire, especially if the Somerset bowlers get it right early in the Hampshire second innings. Here's hoping (and you'll note there's no counting of chickens, only an unusual amount of optimism for me. At the moment, anyway...!). Once again a batsman stands up (it has happened more this year) and the tail has stood with him once again. I think that's basically how County Championships are won. It's what that amazing Warwickshire side of Dermot Reeve's did time and time again to win those titles 20 years ago. They had Lara, we have Hildreth, and everybody, but everybody, finds some way of contributing and getting the team over the line every game, even if they've made a mess of things to start with. THe Warwickshire side of more recent vintage under Ashley Giles that won it did the same thing. If not for the fact that CC the is about to go into hibernation, then I'd think that Cove and Jack could both be promoted up the order at Lewis's expense. If there was another CC game next week, then I'd have Cove at seven and Leachy at eight. Worcs lost the match here because of their drops of James Hildreth. Per the commentators, Fidel Edwards put James down fairly early on here (at midwicket, off Berg, apparently). And James has punished them superbly, just like he did Worcs. There must now be a pretty significant chance that this will prove fatal for Hants too. What's the news on Steve Davies? Did he look badly hurt when he came back out to bat? Despite his annus horribilis with the bat in white ball last year, one would think he'd be a key 50 over performer. The commentators don't seem to really get the difference between swing and seam. When the ball swings and then pitches and carries on curving away (completing the curve that began before it pitched), they constantly say 'it seamed away,' when really it didn't, it simply continued to swing after it had landed. I said earlier today that my impression of yesterday's play was the ball swung much more than it seamed. And I thought the same in the 90 minutes or so that I was able to see today. Yet, if one relied solely on the commentators, one would think that it was seaming all over the place. I think James Hildreth has provided evidence that would refute that notion, noting that "We still need a good deal more runs because it's really a good batting surface." James wouldn't say that, I'm sure, if it had *seamed* everywhere. James is no doubt saying that we need plenty more runs because he knows that a swinging ball could stop swinging at any point in a match/day/innings. And with the surface itself being good for batting on....hence the desire for a really big lead. Edited 1 time(s). Last edit at 2018:05:12:19:26:20 by AGod. I'd agree about the lack of movement off the seam. There's been some extravagant movement through the air, for certain bowlers in certain conditions, and quite a few balls have taken off rather alarmingly. But there's been nothing happening to worry a strokemaker like Hildreth. The fact that Vince managed to make 44, instead of the usual 24, before nicking a catch is evidence of the lack of seam movement. Not sure why Abbott was allowed to bowl when he did after spending so much time off the field after twisting his ankle slightly fielding in front of the CAP, as soon as he finished his bowling spell after tea he went off again. The Somerset twitter feed said Steve Davis had a foot injury, which looked strange when he was being treated on the ground prior to going off. When he returned to resume his innings he looked fine. Edited 2 time(s). Last edit at 2018:05:12:20:04:49 by Roger ivanhoe. Thank you for the info, Roger. I can never remember the details but there are different rules regarding whether or not somebody can bat or bowl after time off the field, depending on the circumstances under which a player is deemed to have suffered an injury. Relegation has been averted in recent seasons, belatedly and bizarrely, but rather like Sunderland in football's Premiership, you can't endlessly dodge the bullet, playing badly and forever getting out of trouble. Five matches played and realistically we have been outclassed in three of them. This time, no escape. Heads must roll at the end of this season. Prediction: Somerset in three days, possibly by an innings, probably by nine wickets. Edited 1 time(s). Last edit at 2018:05:12:20:08:55 by Hants01. SD had no back or foit injury per Andy Hurry. He said dizzy spell. Went off as a precaution then returned fine at fall of Craigs wicket. No drama to see here. 93 run lead with plenty to add. Some people really need to learn some patience! Batting totals are made by 11 players. 145/1 can become 216ao. After some bashing of Craig yesterday how do we all think he did today......? Certainly sound like you say WSM, I looked through the binoculas and thought SD felt sick or such. That was why I looked on the club twitter feed to see any info on there. BBC commentary said he was hit on the ankle by an Edwards delivery (I think). No lasting damage it seems if it were the case, but enough of a sharp pain to make him feel nauseous at the time? Edited 2 time(s). Last edit at 2018:05:12:20:36:16 by Rod1883. Sorry to see on this thread that one or two of our faithful Somerset supporters like Grizzzly (`I wish I could say our batting inspires confidence`), joining the ranks of perpetual re-moaners of the Clarence Parker (`Another disappointing season I fear), and the omnipresent Agod (`We are probably in the middle of one our collapse specials`) ilk. Where are the posters crying out for Bairstow to be promoted to opener, Stokes dropped down a place in the batting order and James Hildreth chose at No.5, when the England squad is announced next week for the first Test against Pakistan? "After some bashing of Craig yesterday how do we all think he did today......?" Well wsm, Overton bowled dross yesterday and deserved whatever "bashing" he got. Only know how many runs he scored today so as I was not present I can't answer your question. Crystal Tom. But wrong as usual! He wasnt at his best but was not dross. I counted 4 if not 5 play and misses and 1 big lbw shout. Yes there were a few short balls and leggy ones in too but nobody can be perfect every day. Today he & James were just awesome. A chanceless 80 from our number 8 at a time where we werw in trouble. Hows that for bottle, mental toughness, fight? We didnt collapse as many would have preferred. Anyway yet ANOTHER quite superb day and as Hants01 says basically 23 points in the bag. Good luck guys making up a scenario where we can fail to win from here. TITLE CHALLENGE WELL AND TRUELY ON! Not sure a win is "in the bag" yet wsm - but we are in a good position. Push on to a 150/170 lead tomorrow and then put some real pressure on their batters and yes we're in with a real opportunity. As long as we don't have to chase something nearer 200 than 100 on the final day we should be OK. The bag in is the room, we've just got to make sure we grab it and not let it slip through our hands. Well the points are not 'in the bag' and if you think they are WSM then you've forgotten the county you support. We'll see where we are at the end of this innings and then see what Hants are made of. We should put this one away but until it is done nothing is certain. However, Craig was very good with the bat today and James punished poor fielding once again. If he stays solid and we keep getting the luck of the draw se have a considerably more positive position in the CC1 at the break and people should be worried about us. BUT we still need the newbies to learn fast and Steve and Lewis have to provide more. Let's hope the bowlers are a level above tomorrow and Hants can't handle it. WSM - As you well know criticism comes very quickly and easily to some but the balance of praise when it's due comes a little slower. It was a fantastic partnership which made batting look very secure in stark contrast to the mornings effort. One particular father looked happy with his lot looking on from the Hill. Edited 1 time(s). Last edit at 2018:05:12:21:18:40 by Nailsea_Fizz. WSM - a scenario in which we don't win? 1) We could knock over the last three quickly, and limit the deficit to 125 or so..
2) Amla is very capable of making those 125 runs on his own, so if we could get, say, 200 runs from the other ten, then we could leave SCCC a tricky chase. The weather forecast is for very good batting conditions for the remainder of the match. So the ball could easily stop swinging. So another scenario in which we don't win sees our innings continue until lunch tomorrow for a lead of, say, 200. And then Hants batting for maybe four sessions in conditions where the track is a good one and the ball isn't swinging and making maybe 375-380 in those four sessions, against initially attacking fields... Amla 150, the rest 225 between them.. it's far from impossible. Its a scenario yes but from where we are tonight wildly far fetched! Hamps have a 4 man attack 1 of which is crocked. They have an out of form batting line up against our attack which have been superb at home in the last 5/6 home matches, not to mention the option of Englands best 2 spin bowlers on a day 3 dry pitch. Edited 1 time(s). Last edit at 2018:05:12:21:25:20 by wsm fan. Yep. I think you are very secure in that assessment. The day started with Tom Abell finishing off an over from the previous day, and once again he manage to beat Brad Wheal's bat. 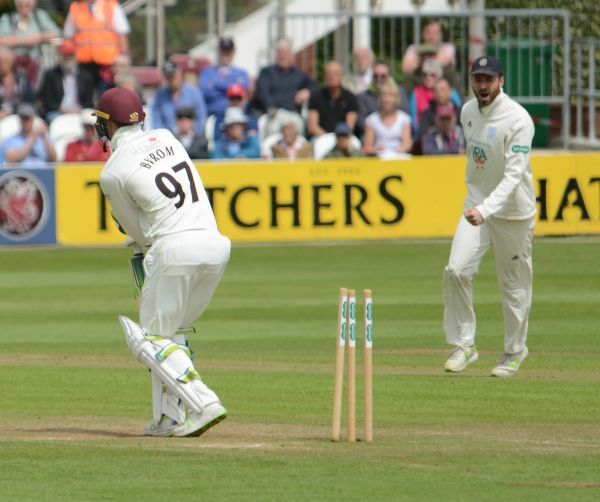 Not a lucky day for Eddie Byrom when he was bowled by Fidel Edwards. Craig Overton played some lovely shots, he leg glanced this ball for a four. Both eyes on the ball for James Hildreth just before he scores more runs. Back to Craig Overton, this four brings up the 100 partnership with James Hildreth. Good innings don't last for ever, after a very good score was reach by Craig Overton he was bowled by Gareth Berg. Lets hope for a full days play tomorrow. That's a pretty cheap comment cj-m & I resent your inference most strongly. At 71-4, with Hildreth dropped in the 20's & Tom having had a daft moment, I doubt there were many feeling confident that we would get anywhere near the score we so successfully did. This thanks to James wonderful innings & Cove's excellent 80, all the more impressive by his running between the wickets, turning singles into two's, & two's into three's. But you choose, for whatever reason, to ignore the last sentence of the post you quote when I said "Everything to play for here. Just need someone to apply themselves for a period of time". You also choose not to quote my later posts when I said we were "still very much in the game" & my comments on Cove & Hildreth when I said "superb batting by these two". If you were being fair, you might consider an apology is appropriate. Agreed - a pretty cheap comment as far as I am concerned as well cj-m. If you are "sorry to see" such, no doubt honestly - held, comments why bother to venture onto here in the first instance. I shall be on the Hill tomorrow looking out for that "particular father." I wonder who he could be? Many thanks for your Private message CJM, which is much appreciated. Last I heard it was 71-4, then I have to play cricket, phone locked away for safekeeping, but then I get it back, wow James and Cove. I think it was much more 'exasperation' than 'doom snd gloom' at 71-4 with Hilda looking ropey cjm. But unlike the true black 'd and g' merchants, our day got a whole lot better. Mike, if Clarence gets to meet "particular father" it could make for a good photo opportunity! If i guess correctly as to whom you are both referring i imagine Tom would be most welcome for a little chat too. Its easy to write opinions on here anonymously whether genuine or just for a reaction, less easy to the faces of a players parent i suggest! I’m just catching up with the events of yesterday. A couple of quick thoughts: this season, one or more players always seem to step up to the plate when this is most needed; there seems to be an excellent team spirit (and I can’t help thinking that Somerset’s policy of focussing on local recruitment and on the retention of players who have been with the County over many years, together with excellent leadership, are major contributory factors). A very sensible post Wickham. Unlike our current opponents just think of the homegrown talent we can put out. Craig Jamie Lewis Dom Jack Tom Marcus Trego all born & raised in the South West. George Eddie James all Somerset educated and trained so they count too! Add the welcome top quality signings of Timmy G & Davies it has the recipe for a great team spirit and bond with supporters. Last Monday at 5 down after lunch we could have crumbled. At 86/4 yesterday & when SD retired hurt, we could have crumbled. We have won 2 out of 3. Are firmly in the box seat to make it 3 out of 4 and with the best batter in the country at number 4, the best 2 spinners in the country in our ranks, and the fastest bowler in England raring to go for a 1st team return this week. Edited 2 time(s). Last edit at 2018:05:13:06:12:08 by wsm fan. Hildreth says we need plenty more. So I'd be more than happy if we could add quick runs in the first hour, then for the innings to abruptly end. I definitely don't want our innings to go beyond lunch. Sun is out and 104 overs due. All out 380 giving a 150 lead. Well, it's a balancing act, WSM. I'm not convinced there's going to be all that much turn though. There was very little on day one. Hildreth said there was a little bit for whoever their spinner was yesterday (not a front line bowler, I know). Obviously, on a conventional track the ball is liable to turn more the longer the game goes. But that's not generally been the recent history of our track. If our track were one that would reliably deteriorate, then I'd be happy to grind Hants into the dust - keep them out there until tea with a maiden ton for the GREAT Jack Leach. But it's the absence of reliable deterioration that makes me think we need plenty of time to bowl at them. Edited 1 time(s). Last edit at 2018:05:13:07:42:52 by AGod. I bow to those who are watching the game but yesterday -as in this season so far- it seems from scorecards and a little watch of live feeds that we are playing with a determination from all. This is the 4th match and our 7th innings. A decent first innings lead which I hope will be well extended, scored at a very decent rate. In those 7 innings 4 different batsmen have scored 100s-2 of them twice and one has a 99 and an 82.The wicketkeeper has a 50 and 2 30s and one bowler has scored 80 and another 66.Every innings has seen someone come to the party and make the difference. Craig yesterday was priceless-but so was his 5 against Lancs and James seems to be riding 4 seasons worth of luck at the moment. It makes for interesting following and while there is bound to be a slip up somewhere, this is a good beginning. Andy Hurry said the reason we fielded after winning the toss and didn't go for the option of bowling last in the match, (that still might happen if we only bat once) was because of the overhead conditions and the pitch was green in the middle. And the overhead conditions for the rest of the match are expected to be very favourable, with tomorrow looking gorgeous. I very rarely have a problem with bowling first at Taunton, as bowling last is usually tough *if* the match goes to day 4 (as vs Essex last year). In various games last year, we batted first and won the match *but* the games were won without need of day four. If all goes to plan over the next two days, this would be our fifth successive home victory. When did that last happen in red ball cricket? I recall one year where the opposition won the toss in each of the first four games at Taunton, put us into bat on green surfaces each time, and we scored 500+ on each occasion, winning all four games by an innings. But I don't think we won game 5. Yes, that sums things up nicely. We've done superbly so far, and hopefully will continue to do so. Can't help thinking this match may yet throw some challenges at us. The likes of Amla & Rossouw being likely candidates to provide these. But, we have the ammunition & certainly the team spirit, to drive home our advantage, so here's hoping we do so. Does anyone know if anything interesting came out of the members Q & A session last night ? The difference this year does seem to be the team 'feel'. Reports suggest more team spirit, more support as a player within the squad and a little more belief in the long term prospects of the sides. Add to that better cocktail the fact that luck has been going with us and we have second chances we haven't had in past seasons, balls have caught the edge, catches have been held by us and dropped by others and the weather has been kinder. All this moves us forward and increases confidence where it dented it in the recent past. If we then add to that the general performances, the order hasn't clicked fully but we have centurions all over the place and so many have hit some form. The great thing is that James has been dropped many many times and has made the sides pay on every occasion. Oh and the tail is very strong in terms of form. All working at the moment it seems....long may it continue. Edited 1 time(s). Last edit at 2018:05:13:09:50:33 by Grockle. By the way, I think I read that Vince said this was already a fifth or sixth day pitch, presumably one used for a previous game? And those words of wisdom provocation coming from you wsm is another case of the pot calling the kettle black. P.S. Said "particular father" and I have already met. I think it's probably some way past time to put the whole "lunch invite," episode to bed, so far as this board is concerned. I didn't know, SP, that we were already on to a used pitch. It had good bounce and carry on the first day for such a used pitch. The 64 million dollar question will be "How much will it turn over the final two days?" The forecast is very promising from a spectator point of view, but potentially ominous from a swing bowler's point of view, so I think we shall need it to turn. Everything looks absolutely pristine this morning - the ground and weather competing with each other for a beauty award. 76.5 - Edwards to Leach - very, very nearly a carbon copy of the ball that got Eddie Byrom, but came back a fraction less and just missed the off-pole. Fidel getting decent shape, even with the cherry being 78 overs old. What a difference a season makes. 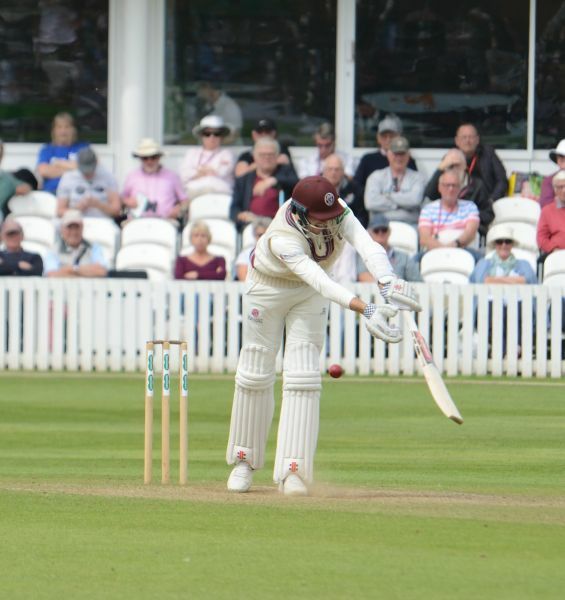 In the second half of last season, with Somerset 30 points adrift in the relegation zone, it was a succession of performances like those of Hildreth and Overton on the second day here that led Somerset in the end to safety. That and the team spirit that underpins such performances. 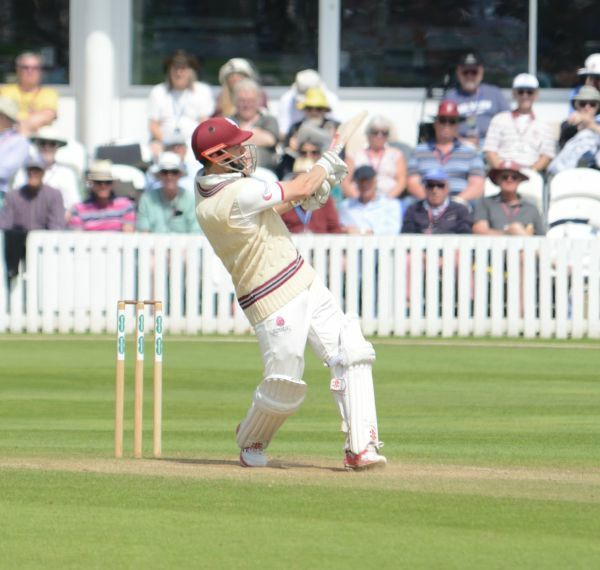 Now such performances are driving Somerset towards the top of the table. The team spirit that saw Somerset through at the end of last season is there this in abundance for all to see. There is every possibility that a win here will leave Somerset at the top of the table. If Somerset do win this match, and there is much work to be done to achieve that as the pitch, as is its wont, appeared to be flattening as the afternoon wore on, then the pressure will be of a different kind. The pressure will then come from the need to sustain a position at the top of the table. The pressure which will come from the weight of anticipation and hope that Somerset could, finally, end a century and a quarter in quest if that first Championship. In microcosm that is now the position in this match. From a position of some jeopardy at Lunch Somerset moved to a position which threatened dominance by the close. They are on top of this game at the moment. Crucial now to sustain the pressure that the later batsmen applied to Hampshire when Somerset were at risk and continued to apply as they tilted the game Somerset’s way. It didn’t feel quite like that at Lunch on the second day. 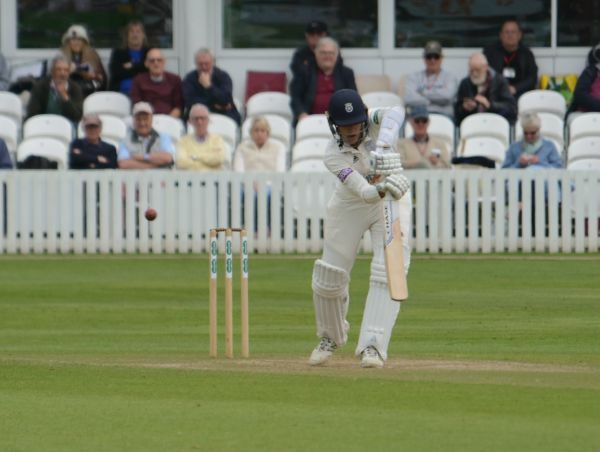 Hampshire were in the ascendancy in spite of Abbott being in the Pavilion and unable to bowl. Their remaining three seamers had been carefully husbanded by Vince. Berg, Wheal and Edwards maintained a disciplined tight line and length. They tested the Somerset batsmen ball after ball. Edwards added the spice of pace to the mixture. The ball continued to move and passed the bat with some regularity. They bowled with considerable attacking skill too. The ball that bowled Byrom was as good as any you will see. 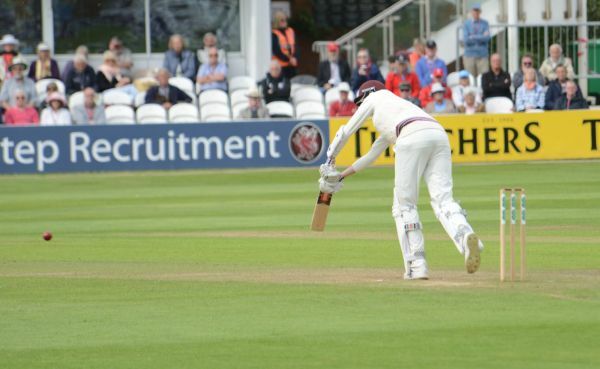 I was sitting at the top of the Somerset Pavilion directly behind the keeper so it was impossible to pick the later trajectory of the ball but my instinctive reaction was that it was unplayable. A view of the highlights confirmed that. Bowled at pace it seemed to move in late and then more off the pitch. The balls that removed Bartlett and Renshaw too spoke more of bowler skill and intent than batsman error. Only Abell contributed to his own demise with an ill-judged hook on his arrival at the wicket. Renshaw, at least had used his time at the wicket to good effect scoring 36. There were a couple of scintillating drives and a chip shot for six over third man that took the breath away. 86 for 4 at Lunch, with Hildreth and Davies at the wicket, was a tremendous return for the Hampshire attack shorn of Abbott. It would have been better still had Hildreth not been dropped by Edwards. Not a difficult chance. Perhaps the exertions and intensity of his bowling played a part for it had looked as if he was giving his all whilst the ball was hard, perhaps knowing that three bowlers could not keep up that intensity indefinitely. Someone said to me, “Hampshire have bowled better than we did yesterday morning. They have kept a better line.” And so they had, Gregory in particular coming in for criticism. Just a note about Gregory’s bowling on the first day. His first three overs: 3-0-21-0. The remainder: 11-3-20-2. It cannot have been all bad and it wasn’t. His final spell was as good as anything Hampshire bowled at least as I saw it from the top of the Somerset Pavilion. My lunchtime circumnavigation of the ground had left me with insufficient time to return to the top of the Somerset Pavilion before the first ball. I decided to watch a few overs whilst standing in the sun next to the covers store. As I stood there the Hildreth Davies partnership started to develop. For the first time in the match two batsmen began to put the first building blocks into developing an air of permanence. Superstition is of course an irrational nonsense. It doesn’t stop it taking hold though. I was becoming uneasy about the prospect of returning to my seat at the top of the Somerset Pavilion in case it broke the partnership. Do not mock. I had already taken Abell’s wicket by not returning in time from an untimely between overs visit to the kiosk behind the stand. Hildreth and Davies played steadily and the runs began to accumulate. Somerset were still behind in the match and so the tension in the air hung heavy. Then it began to be punctured with some stunning cover and square drives from Hildreth. From the angle I was watching from his bat seemed a long way in front of his body as he played them but the ball never left the ground once it had made contact with it. It is difficult to think of a better batsman when he plays like he did yesterday afternoon. They had just about taken Somerset to a position from which prospects of a lead were not an unreasonable hope when I noticed Davies laying on the ground. He was holding his head in his hands. No-one around me had seen anything untoward happen and he did not appear to have been struck by a ball nor had he shown any sign of injury. Whatever the cause it was sufficient for him to walk off the field. Those prospects of a lead did not now look quite so good. I decided there was no further purpose to be served by watching from the covers for the partnership had effectively been broken. I returned to my seat and got Lewis Gregory out instead. Or rather Wheal got him out by getting enough lift to take the inside edge of the bat as Gregory tried to withdraw it. When form deserts a batsman luck goes with it and the ball found its way onto the stumps. 134 for 5, Davies hors de combat and still nearly 100 runs adrift. How quickly cricket can change. Now Somerset’s spirit showed itself with a vengeance. One of the leading lights, perhaps at the moment the leading light, of Somerset’s new generation joined one of the diminishing list of seasoned campaigners. They transformed the game and they transformed it in the true Somerset style and with true Somerset spirit. It was a heavenly hour and a half of supreme batting. Even the return of Abbott to take some of the pressure off the other bowlers made no impact although he looked out of sorts, perhaps nursing the injury which forced him from the field earlier in the day. 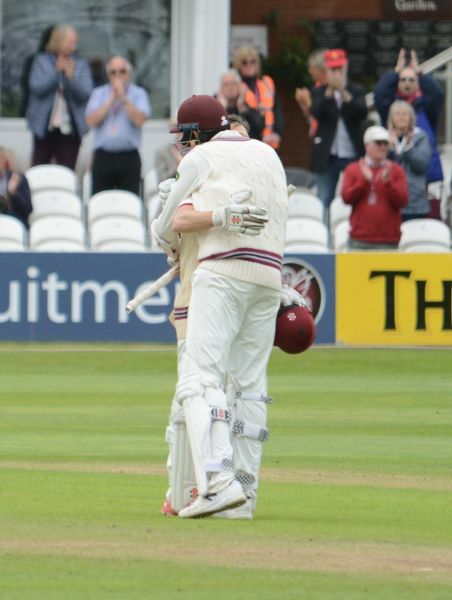 Hildreth was by now displaying a sense of permanence and Overton batted with the authority and security he had shown whilst defending for an hour at Old Trafford where he had played a key role in saving the game for Somerset. Here he attacked at pace as the scoreboard closed the gap on Hampshire. He angled the bat to play through and around the slips, he drove with power, he pulled where the ball demanded the shot, he leaned perfectly into one glance to the Colin Atkinson, he pulled, or more accurately ‘swatted’ one short ball through mid off, again to the Colin Atkinson. He looked perfectly secure in spite of the scorching rate of scoring. I had been chatting on Gimblett’s Hill at Tea and stayed there when the batsmen came back out. I stayed there for the rest of the day. The sun was now shining, in the sky as well as at the wicket, and the faces were smiling. The cricket was glorious and Somerset were totally dominant. Hampshire’s score was surpassed and only one wicket had fallen since Lunch. Overton’s wicket had not seemed threatened at any time during his innings and it came as a reminder of the great uncertainties of cricket when he chopped on for 80. But what an 80. He was applauded all the way back to the Pavilion, with the sort of reception usually reserved for a century. Relief for Somerset supporters as Davies returned to the wicket although he did not add much to his score, departing for 33. But that brought Jack Leach to the wicket on the back of his match saving innings at Old Trafford. He carried on where he had left off. He did not look like a number nine. He batted with total assurance, one cover drive would have challenged any batsman for style and effect and had people gasping. And Hildreth, what of Hildreth? 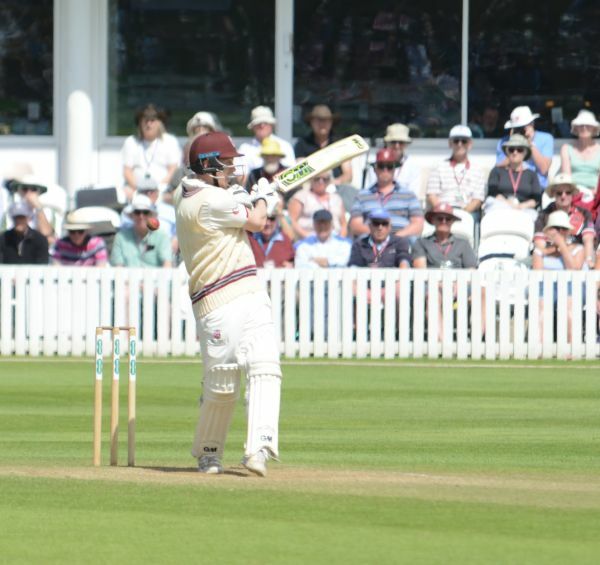 He scored his 41st century for Somerset and Somerset’s sixth century of season. There were but nine in the whole of last season and only three batsmen have ever scored more centuries for Somerset than Hildreth. And with this one, alongside Overton, he had moved Somerset from the risk of defeat to the possibility of victory. After he was dropped in the 20s he had never really looked like getting out. And so Somerset ended the day 93 runs ahead, with power to add and the fitness of Abbott to bowl in question. 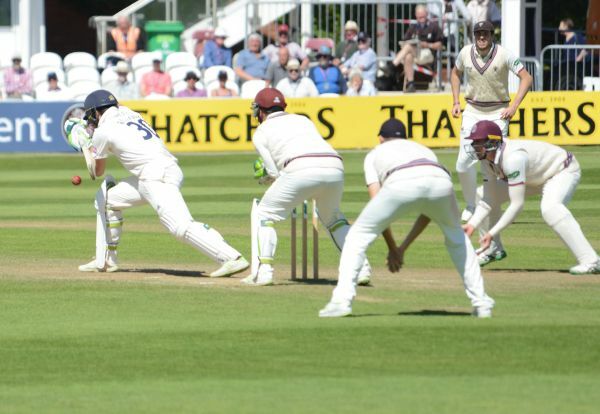 If the pitch is flattening to the degree Hildreth, Overton and Leach made it appear to be, and it may not be quite as flat as they made it look, then Somerset’s task will not be an easy one if Hampshire’s batsmen show the resolve their three bowlers did at the top of the Somerset innings. It will require focus, patience and unremitting resolve. 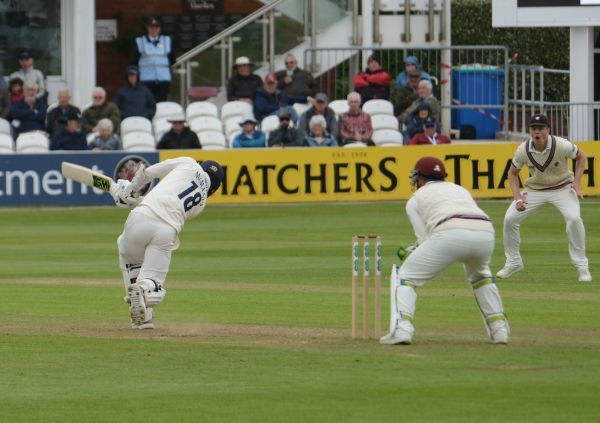 Somerset have shown just that in winning two games, saving a third against the odds and in overcoming the crisis of this game to reach the position they now hold. They have too shown in those matches the sort of team spirit that I saw Essex show at Chelmsford last season. It is perhaps that that provides the greatest hope for this season. 78.4 Fidel to Leachy.. this time it IS a repeat of the Byrom ball, and with the same result. Great bowling again from Fidel. Notts have already lost another one this morning, as Bunny Onions continues to scythe through them. I really think the batting side should have the power of veto over such warnings... if we are happy for him to run down the track, then he should be allowed to do so. I'm not sure how Dom survived that lbw shout from Berg? Well, WSM, we certainly have a big lead now!! When will today's main event commence, one wonders? Bess has outscored Hildreth to reach 75 n.o., James has moved serenely on to 175 n.o. and the two of them have an unbroken partnership of 126. We have a lead of over 200, with maximum bonus points in the bag. The pitch may be dying, but the scoreboard pressure on Hants. is increasingly. Doesn’t get much better than this ! Hildreth dropped yet again - this time off Fidel, rather than by him. Finally they take a chance off James. Will Dom now be stranded short of his ton? Or will the world's best number 11 make an appearance? So do we declare and take 5 sessions at them or come out after Tea and look to get Dom to a hundred? Give em 45 minutes but no more and then? Get 'em in and let's see what they are made of. Well, Dom certainly did me proud on my return from his home county. What a splendid morning's batting apart from Jack's aberration (after playing a little gem last night). Lunchtime declaration or give Dom a shot at his ton? I'd like to see the former. I’d give Dom 3 overs to get his ton. The stream shows quite a lot of cloud coming over. IF we come back out then I think it needs to be expressly time limited i.e "Dom, you've got thirty minutes, and then we're declaring, so you'd better try and hit the cover off most things to make sure you're 3 figures when the declaration comes." Fortunately, I think Dom has the mentality that, even if we don't tell him something like that, he will come out and try and thrash the bowling around anyway, versus nervously nudging towards his maiden SCCC first team ton. Still great morning session. Declaration and get in to them would be my shout. See if we can find anything left in the pitch. World's Best No XI doing a noble job of playing for Dom's ton! Shame for Dom but credit to Berg who has steamed in and given a lot to this game. 92 and 275 ahead... not bad. Dom *livid* with his dismissal... exactly the right attitude....precisely the type of attitude which will surely lead to many more ton chances, and indeed some tons, in the future. And brutal stuff from Timmy G.
4 sessions plus about 105 minutes left in the match. Weather set fair. So, hopefully, worst case scenario of them batting for 4 sessions and scoring 350 or so in the process. Would leave us 76 to get in 105 minutes, which should be achievable. That's assuming that the track turns. I still think it'll be flatter tomorrow, so I think we need to take at least 5 wickets, and preferably 6 today. A misjudgment and wicket number one! Good bowling from LG - getting some nice swing. That being the case, in addition to TG coming on soon, probably worth a little bit of Tom prior to the spinners coming on. I'd fancy Tom quite strongly to get Vince nicking off to the slips. Been out this morning at a car show, just got back. Would just like to say Wow! Come on Somerset, let's grind them down with some really accurate pressure bowling. Good performance from LG in this second innings, thus far. Well done, Tim and George. Great bowling and field placement by TG. As for Weatherley, don’t think that was his finest moment ! Still very little sign of any turn from the main surface of this track, which is very disappointing but not particularly surprising because the recent history of our track is that, if it's going to turn, it will do so early, and it didn't in the first innings. I think the seamers are bowling pretty well and they sometimes look as though they might get a wicket, but I'm starting to fear a draw here, particularly as batting conditions are likely to be at their best tomorrow. Back to the Ciderabad strategy please, Andy, Jason and Simon (Lee). This is back to the old, predictable, surface of getting flatter and flatter and flatter. Ultimately, I think we may pay the price here for not bowling well enough in the Hants *first innings*. We've bowled much better second time around but, had we hit our straps the first time around, we may well have bought ourselves an extra 30 or so overs in which to bowl them out in their second innings..
(of course it might be that even an extra 30 overs would make no difference. Edited 1 time(s). Last edit at 2018:05:13:18:31:45 by AGod. Tremendous day with the bat and our bowlers kept plugging away without much luck. The pitch however is doing a very good impression of Monty Pythons dead parrot. Well it makes the task simple. One day Amla and 7 more wickets. Another truly dreadful day with the Hants (depleted) bowling attack mercilessly flogged; of course it doesn't help when you put down sitters as was the case with Hildreth early on. 71-4 to 500 plus- appalling. Then, as predicted, our batsmen started getting themselves out rather than Somerset getting them out. This season needs to be Adams' last and Weatherley...well, it's just shocking. Vince has hitherto refrained from his more lavish strokeplay, but my prediction is that he will take the bait in the end. I predicted Somerset by nine wickets or an innings and I stick by that. Merely, it will delay the inevitable- finished in four not three days. Somerset ought to know: 1) with this lot, they tend to get themselves out; 2) wickets go down in clusters; 3) the tail is long and 4) I expect some stupid cricket along the way, like a daft run out. Once again hopelessly outclassed and yet Giles White survives it all. Well, I don’t think an unbroken partnership of around 140 is anything to sneeze at Hants01. It’s still a long road to safety, but it’s also a long road for us to get eight more wickets. Excellent batting this morning from James Hildreth, Dom Bess (very pleased for him) and Tim Groenewald. They batted well but the pitch appeared to be as dead as a Dodo. Informed from two separate sources that the pitch in use is the same one used only two weeks ago for the Yorkshire match. If we thought that the pitch would deteriorate on account of its recent use, then the plan has seriously backfired. I shall not journey to the ground tomorrow; instead finding other things to do. It is of course still possible for us to win, but despite my absolute confidence and respect for Simon Lee and his hard – working assistants, I do wonder why at this stage of the season we have to use pitches that have previously been used for 4 days. There must be a number of pitches on that square that have not yet had an outing this season. Cheers for that Hants01. Saved me a positive report! A new day tomorrow, fresh bowlers, new ball around the corner, weak middle lower order and low on confidence batting line up. It may be hard work but still huge favourites. Just break this partnership and we could lunch on a net 20/5 with 65 overs left. Bowlers stuck to it well and Vince always has a nick off at somepoint! 24 points on there way and sitting pretty at the top.by 6pm! b) No help from the overhead conditions. Yes, Vince (and Roussow) might do something stupid (Vince already nicked off once) but this is now the kind of pitch on which all but an old fashioned number 11 (or Fidel Edwards!) could expect to score 30-40 without too much trouble. Berg is very capable. So, too, if fit to bat, is Kyle Abbott. Having said that, of course, the draw was also a clear favourite going into the final day at Old Trafford, and we nearly contrived to mess that up, until Leachy, Cove and TG saved us. But even if they wobble (as we did) this pitch, like Old Trafford, is flat enough that they will probably still get out of jail. I'd say the chances are 75% chance draw, 25% chance SCCC win, 0% chance any other result. Edited 1 time(s). Last edit at 2018:05:13:20:16:17 by AGod. The new ball will be available within the first hour - and will be the key to the day`s events. We might get the new ball to swing a little for a brief period. But I think the absence of turn will be our undoing.... even if we did manage a couple of wickets with that second new ball, then they'd be only 50 or so behind, 4 down, and we saw today how hard it is to take any wickets with an older ball.. Let's be honest, it's also true that the two that fell to the new ball today were giveaways, really, rather than the new ball doing all that much. b) Hants will need to bat like muppets. It will be a big day for Craig Overton, as he is surely likely to need to take a number of wickets if he's going to be named in the Test squad on Tuesday. And Leachy may also need wickets for the same reason. Personally, I thought LG and TG looked comfortably our most likely wicket takers today, however. Read Hants01. That added to our top notch attack is why we WILL win. We showed Monday what can happen batting day 4 on a supposed flat lifeless pitch. And our bowling is better than Lancs was and Hamps dont have Craig Jack & Tim to do their stuff with the bat. Get Amla by lunch we win. Simple. Vince will give chances and rest will fold as Hants01 says. Edited 1 time(s). Last edit at 2018:05:13:21:06:56 by wsm fan. We need to break this partnership and get into the lower order. Not much in the way of photos today, with so few wickets falling today it didn't make for a good photo taking day, I packed up early hoping that might do the trick and get us a wicket, that didn't work. A total misjudgement by Jack Leach this morning, it always looks bad when you don't play a shot like Jack did off the bowling of Fidel Edwards. The moment before the ball hit Dom Bess stumps bowled by Gareth Berg. And the moment after the stumps are hit, Dom Bess still had a good knock though. What a great innings from James Hildreth, one of his many fours he hit in his large score. A four from Dom Bess which also brings up the 100 partnership with James Hildreth. 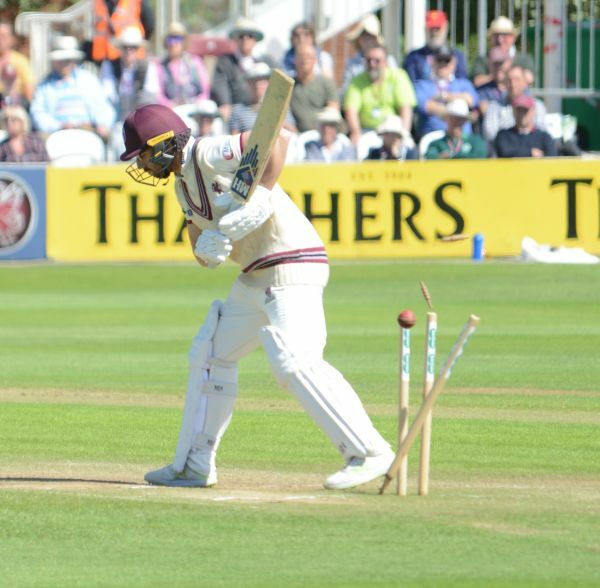 We must take early wickets tomorrow to have any hope of winning the match, how the Somerset players manage to keep going like they did on this pitch heaven knows, but they did. Yes, Mike, the paradox was that they bowled far, far better, when conditions were loaded against them today, than they did first up in this match, when conditions were favourable for swing bowling. Paul Edwards' reports on ESPN continue to be a brilliant read. He is a throwback to great wordsmiths compiling readable pieces in the quality press: David Foot, Doug Ibbotson, Alan Gibson, etc. We should fold tomorrow. I have no confidence in the team or the management. Weatherley has got himself out in totally irresponsible fashion in Nottingham, hitting the slow bowler to mid-on and now today. More gifts abound. Adams and tomorrow. If Somerset are to properly tilt at the title tomorrow is a game they will win. 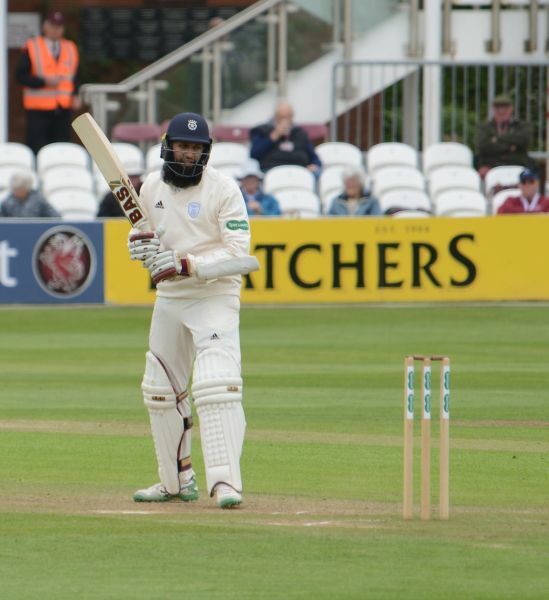 At Nottingham, after Amla's effort, the next highest score was ten. It is quite remarkable that Hildreth- accepting multiple gifts of dropped catches- has not had international recognition, given his first-class average and the habitual failure of incumbent Test batsmen to occupy the crease and apply themselves. Watch for Rossouw: an hour for hardly any, 20 or 30 with some fluent hitting, then out, is the way of it so far. Amla and Vince out by lunch and Somerset knocking off scarcely any- you may yet win by an innings, so bad and terminally useless (in my opinion) is this team. Crikey Hants01 it sounds just awful. I shall sleep easier now knowing it cant possibly go wrong as i knew anyway! But did you see how little assistance there was for the bowlers, Hants01? I know that Hants have probably been low on confidence, not in great form etc, but today's long stand from Amla/Vince will surely have boosted their level of belief. There's absolutely nothing to fear from the pitch and, in common with every county side, SCCC don't have that world-class 90mph bowler or wrist-spinner who's going to blow a team away in unhelpful bowling conditions. Pot calling kettle black Clarence, what are you on about. The fact you have no faith in our attack to wrap the game up speaks volumes. I was going to say lack of support but its pretty clear you and several on here are not SUPPORTERS. Members maybe, followers yes, attendees occasionally possibly. But SUPPORT is a pretty simple concept and escapes many sadly. We have had our best start in years and are well positioned to make it 3 wins from 4 and a massive 74 points. Supporters would be positive that despite Amla and a tougher pitch we could still do it. Enjoy your day not at HQ and i sincerely hope you miss a wonderful days cricket and a hugely important Somerset win whether it comes at 3pm 4.30pm or 6.45pm! Must be Vince's slowest 50 ever, Amla passed him even before his beehive started buzzing. WSM... you seem to confuse *wanting* a team to win with *expecting* a team to win. The former has to do with being a fan of a team. The latter does not. I bet you that if you held Tom Abell down last night, put the thumbscrews on him and asked him if he genuinely thinks that a win here is more likely than a draw, then he'd admit that it is not. And that would be because he knows how much conditions were loaded in favour of the batsman AND because he knows that our pitch is usually at its very best for batting on day four .. in other words, batting will probably be even easier today. Now, each cricket ball seems to have its own vagaries .. *maybe* the new nut will swing more and/or for longer than the first one that we took... if so, then we may be able to put them under pressure......... but if you, WSM, are expecting significant help from the pitch, then you will be out of luck. If you're expecting significant help from overhead conditions? Ditto. Yeah, I know, you've still got the notion that Hants are so incompetent and feckless that they will fold anyway if only we can bowl accurately............but weren't Lancashire badly out of form, with bad results behind them etc going into our last match... and how did their batsmen fare against accurate bowling from us on a flat pitch? Also, we already did a good job of bowling accurately, for the most part (TG and LG especially) yesterday... and they did not fold. Oh, and one of the best batsmen of the past twenty years is currently at the crease..
Edited 1 time(s). Last edit at 2018:05:14:07:42:36 by AGod. Lets think positive, if this match end in a draw it will still not be a disaster, but if we win that would be great. If I have worked this out correctly with a draw we would have closed the gap on Notts to seven points, with still a game in-hand. The next thing I noticed was the size of the crowd. Certainly the largest of the three days to date and well spread around the ground. Even the Somerset Stand, farthest from the pitch, had enough of a spread of people to be described as polka dot. There was, I thought, more of a smattering of people not entitled to a bus pass than is normal at a Championship match these days. The weather, and perhaps Somerset winning matches and riding high in the Championship drawing people in. It would have been a good morning to bring someone along to a Championship match for the first time. The weather would have done nicely to illustrate the term ‘cricket weather’, and there was space to amble, chat and relax whilst taking in the cricket. One of the great joys of Championship cricket on days such as this is that you can amble and roam as much as you like and you will feel your belongings are as safe left in your seat as they would be locked in a safe at the bank. I can think of no other event where you could do that with 2000 strangers in the venue. The cricket too was of a type, as Hildreth and Bess set about building the Somerset lead, to hold the attention however much you ambled and however many people you talked to. That is the other thing about the Championship. You could sit, at random, next to virtually any one of those 2000 people and converse with them for the rest of the day and it would feel like the most natural thing in the world to do. One straight drive from Hildreth a thing of such perfection it would have you talking of the beauty of his stroke play and making comparisons with the power of Renshaw’s drives and perhaps remembering Trescothick’s cover drive. And it would not matter much whether the person you sat next to was a Somerset supporter or a Hampshire supporter or whether you knew them or not. On this day I found myself a perch towards the back of the lower tier of the Somerset Pavilion next to Gimblett’s Hill. The Hill was packed and bathed in sun except the back row which follows the arc of the sun and seems in perpetual shade. As I looked back at the cricket Bess drove Weatherley back over his head for four to the Botham Stand just as the man himself might have done. As is his wont Bess took no prisoners. 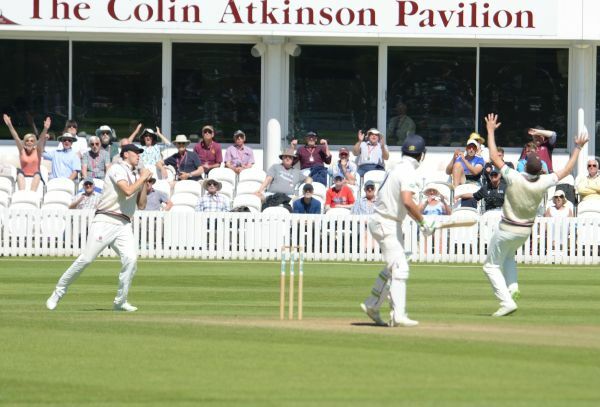 Berg, the pick, and the and most persevering of Hampshire’s bowlers, bowled him what looked like a slower ball bouncer only for it to be caressed, if you can do that with a hook, to the Colin Atkinson Pavilion. Later in the over, pitching up, Berg found himself being driven brutally backward of point for another four. That took the score to 410 for 8, over 80 runs scored since the start, and still an hour to go to Lunch. It was scintillating stuff and it had brought the crowd to life. The County Ground buzz had much to buzz about. I looked at the scoreboard for some explanation. 83 runs so far in the Hildreth Bess partnership and Bess had 60 of them. I have said before Bess marches towards the sound of gunfire. The story continued out in the middle. Bess striking boundaries. Hildreth placing the singles and rotating the strike. It shouldn’t work that way around with a number four and a number ten. But as I said earlier this number ten is held in a queue. And he was making a case to jump the queue. One cut backward of point off Wheal being particularly forceful. Not that Hildreth, for all the art in his stroke play, is incapable of using main force. 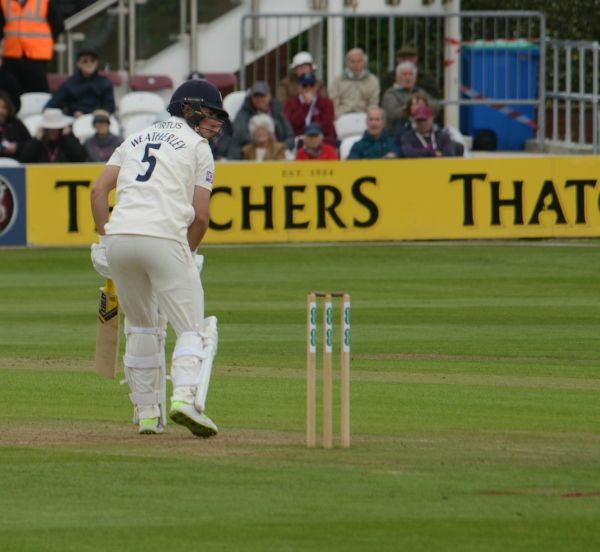 He selected Berg, who had switched to the Somerset Pavilion End, to hit back over his head for four. He then cut Wheal backward of point. There were four fielders on the boundary for Hildreth who was now on 163. “They can put fielders on the boundary but they can’t stop the fours,” said the Hampshire supporter siting in front of me. It wasn’t entirely true but the way the Somerset score was mounting it felt like that. It had mounted to 463 for 8. When the boundary boards were not being peppered deep point and third man gathered in a rich harvest of gently steered back foot drives and cuts as both Hildreth and Bess took advantage of the gaps in the infield to rotate the strike where the boundaries were not available. The harvesters couldn’t though stop the boundary when the batsmen cut clean and hard, past backward point, and between them. Edwards resorted to the last throw of the pace bowler leaking runs on a flat pitch. He bowled a succession of bouncers just within the height limit either to tempt the hook or restrict the scoring. It did restrain the scoring rate for a while and induced Hildreth into one hook that went so fine it flew between keeper and first slip for four. Then, infuriated by the persistent short pitched bowling someone in the Somerset Pavilion shouted, “Rubbish!” Edwards responded immediately with a fast ball well pitched up. Hildreth drove it back past him with some ferocity for four which seemed a bit inconsiderate. Then Bess cover drove Vince hard to the Colin Atkinson scoreboard which dutifully increased his score to 80. “Shot!” said the Hampshire supporter in front of me, and added, “Perhaps if the wicket is that flat Hampshire can bat out tomorrow.” It was a thought that was beginning to impinge on the thoughts of Somerset supporters too. 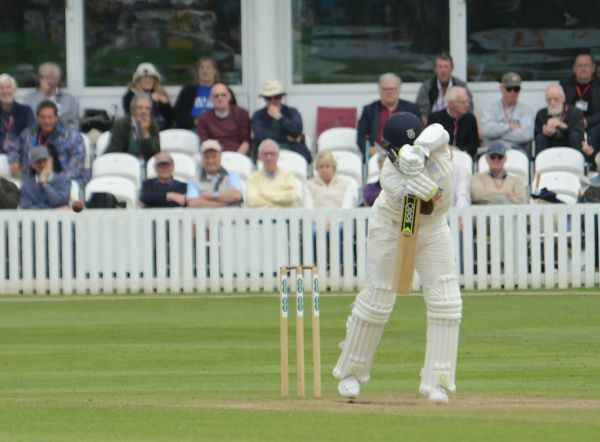 And then in the over before Lunch Hildreth pulled Alsop’s occasional slow left arm straight to mid wicket and he was gone for 184 and Somerset were 472 for 9. After Lunch Groenawald set about ramming Somersrt’s dominance home. He cleared the ropes twice, and Bess, although starved a bit of the strike pushed towards a century until he was bowled by Berg, his fifth wicket, for 92. Bess had played straight and looked startled at the result. Hope perhaps for Somerset’s bowlers, or perhaps a misjudgement. 506 was a formidable total, only thoughts of the pitch flattening submitting a nagging doubt to dampen the spirit. It constituted a lead of 275 of which Groenewald, in his display of summer pyrotechnics, had contributed 25. As Hampshire took up their defensive positions in the face of that 275 deficit Overton and Gregory powered in. 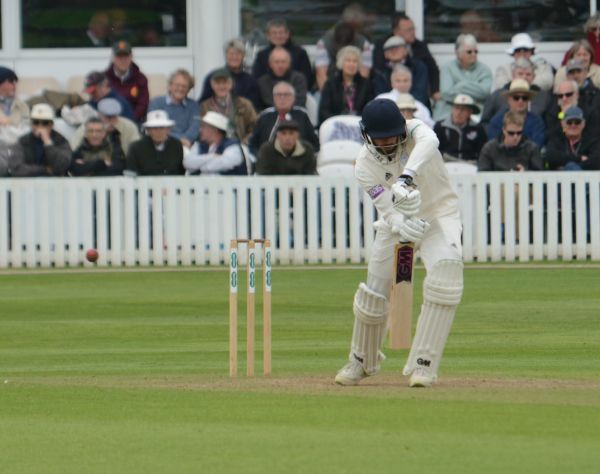 The Hampshire batsmen looked in no trouble as they began the job of shoring up their position. Then Adams stopped shoring up, attempted to cut Gregory, and edged to the keeper. 15 for 1. Next Vince edged hard and low to Overton’s left at third slip. Overton got a hand to it but it went down. He was furious with himself but he has caught a number as difficult as that and they cannot all stick. Soon Weatherley took another brick out of Hampshire’s defensive wall and had the Hampshire supporters in front of me shaking their heads. It had taken a long time for Somerset to manoeuvre Bartlett to deep mid wicket and satisfy themselves the rest of the field was where they wanted it. Groenewald duly dropped short, Weatherley pulled, Bartlett accepted the gift and Hampshire were 49 for 2, still 226 behind. “The next batsman is Hashim Amla,” said the announcement. “And that will be about it,” replied the Hampshire supporter, referring to his view of the paucity of the batting to follow. “I am afraid it is,” was his colleague’s reply. Somerset never got to see the batting to follow because Amla and Vince set themselves to rebuild Hampshire’s wall and bat out the day. They did precisely that, Vince taking 158 balls to battle his way to 50. Amla scored more quickly but without diminishing the security of his wicket. 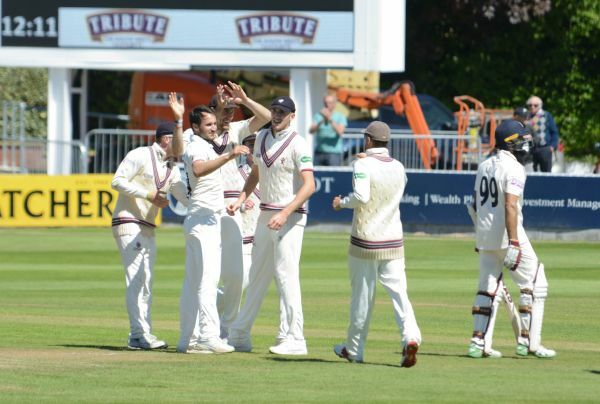 The Somerset bowlers applied themselves to their task. They attacked the batsmen but found little aid from the pitch. I watched a few overs from the Somerset Pavilion roof terrace. I was directly above the line of the stumps as Gregory and Groenewald pushed at the Hampshire wall. The Quantocks did not seem sure about Somerset’s chances. Only one field was ploughed to reveal its version of Somerset maroon. As I watched, Gregory was getting some very gentle swing but it didn’t remotely trouble either batsman. Only twice, and from two balls in succession, did he obtained significant late swing. It beat Amla both times to gasps from the crowd. Groenewald, as far as I could see from behind the batsmen, was getting no movement and was maintaining a consistent middle and off line with the occasional ball a foot outside off, perhaps to tempt the drive. What I saw did not generate confidence that a wicket was about to fall. Overton tried a longish spell. He beat the bat once or twice and had a loud lbw shout but it looked high. Leach and Bess tried some short spells of spin, Leach from the River End and Bess from the Somerset Pavilion End. Neither really looked like taking a wicket although Bess did elicit one or two gasps with balls that might have done something. Abell tried himself immediately after Tea in the traditional opening bowler’s slot and was punished. Perhaps he should consider whether he is beginning to over bowl himself and think about when his intervention with the ball is likely to be most effective. His bowling has been a key asset this season. Its use may need to be targeted. And so Somerset enter the final day still nearly 100 runs ahead. Hampshire enter it with eight wickets still in their defensive wall and a flat pitch on which to defend them. Apparently Maurice Tremlett used to tell his teams that trying to win a Championship match was like trying to push a wall over. You have to push relentlessly. If the third afternoon and evening were anything to go by there will be no lack of pushing from Somerset. The question will be: how strong a wall will Hampshire and the pitch constitute? Having been there for the last 2 days and seen quite a lot of Hampshire too I still think Somerset will win quite easily as once one of the current pair are out then you are down to the tail! Yes, MIke, your maths is correct. A draw would leave us 7 points behind Notts and with a game in hand. This will be a far better position than we are usually in after four games - and most certainly a better position after that many games than we have ever been in since being promoted back to the top flight under Justin Langer. It would be a strong position from which to build, albeit we will have already played 3 of our allotted 7 home games .. including both of the ones against what are probably the two weakest sides in CC1 (Worcs, Hants). The fixture list will get tougher from here. Remarkably, if WSM's info about Jamie Overton is correct then, given that Josh Davey is also now fit, I think we can say that EVERY bowler on the club's staff is currently fit.. every single one of them..... in the recent past LG, JO, Ben Green and Ollie Sale have all been plagued with injuries, yet all are fit. It would be great if we could get through this 50 over window, with all bowling options still fit. AGod, may I say that your posting of 07:41 today is IMO absolutely spot on the mark. One can only hope that wsm will take the good points that you make on board. Sadly though, akin to expecting a comprehensive Somerset victory today, I am not confident. Perhaps he should change his moniker to 'wsm supporter'? While all of AGod's comments stand scrutiny, there are other factors. We are 100 ahead. The 2 batsmen in are indeed superb players but one good ball,one false stroke and they are gone, They both have decent scores already and I expect at least one, plus 2 others to be out by lunch. I am assuming we shall bowl decently so that will be 5 down with the scores more or less level. Hants can't just shut up shop for 96 overs but must continue to push the score a little for a target of 100 in the last session would be gettable. The bowling side always holds an advantage in situations such as these even on an unresponsive pitch because every ball is a potential wicket while the batting side needs to bat for a further 60 overs at least. So we only need 8 balls...Hants have to survive for 360 at least. The outcome is far from settled and I should not be surprised at a Somerset win. That I hope is as objective as I can be 350 miles away. Edited 1 time(s). Last edit at 2018:05:14:10:22:15 by geordie moonraker. Well, I hope you're right, GM. But, if we don't get Amla either immediately, or in first few overs with the second new ball then I think that he, at least, will bat throughout the day, unless he's left high and dry by the others. But, ultimately, our pitches don't deteriorate (which is why the decision to insert Hants, IMO, was the correct one, especially given the day one weather) and our guys are left with a dead pitch that is, effectively, 7 days old (I think Worcs only lasted three days?). Let's hope for one of those new cherries that inexplicably swings a great deal!! Commentators seems to be suggesting that he's not out there? Radio reports that he is having a scan after being hit on the thumb in practice this morning. Booger. Thanks for info, Grizz. Hope and pray that he'll be good to go by the time the CC resumes. As requested by the mobile users. I'll close the main thread, ask people to post here and then merge them later. Edited 1 time(s). Last edit at 2018:05:16:10:45:53 by Grockle. NO early breakthrough so it's new ball or bust vs the centurion, Amla, and bust is more likely than the other alternative vs Hashim. If, as has just been reported, Jack's finger is bandaged up, but that he's stayed on the ground rather than gone off to the hospital then, hopefully (fingers crossed) the finger might be cut rather than broken? Edited 1 time(s). Last edit at 2018:05:14:12:03:40 by AG on apple. When more than one all-time partnership record (Hildreth & Bess), Vince & Amla start falling in the same match, then you know that it's irredeemably flat, pitch wise. That is very true A God but batsmen are human and make mistakes. Yes, GM, and it sounded a bad one. And I am grateful for it. All three wickets to have fallen so far have been to poor shots. Roussow not ideally suited, temperament wise, to blocking all afternoon. I'd think we'd do well to get Dom on against him again, as in the first innings, to try his patience. My thinking of level scores with 5 down is not too far away.I am still hopeful and if we do it it will be to the team's tremendous credit. Leachy confirmed broken thumb - awful news. Not sure that he'll be back in time for the Notts home game (after which we'll have played 4 of 7 home games, so running out of time for him to bowl on some nice Ciderabad tracks this season already). What are these stupid commentators talking about? Trying to make out that the Test strip in NZ on which Leachy bowled was highly conducive to spin? Not in the match that I watched it wasn't. My hopefulness is beginning to fade I'm afraid. Puzzled why Bess hasn’t been brought on. Which he now has ! This game is pretty much dead unless we can take 2 wkts in the next 20 minutes, which looks rather unlikely. Well, the drop of Vince yesterday was essentially terminal for our victory hopes though, even had it been taken, one wonders whether this unyielding surface would have been the only winner in this match. Even sans Jack, we must go back to Ciderabad with the aim being to get all matches finished inside three days, as the surface is so often hopeless on day four. It would have taken an effort of quite staggering ineptitude for Hants not to be able to bat out that game on that pitch. I know Hants01 assured us all that Hants were more than capable of plumbing such depths but, really, on a surface like that one only a side that had already been relegated (and thus given up on their season) would be anything more than a really outside bet to get beaten. Even Roussow, with a Hants average of less than 19 since he went there (per Kevan James) was able to deal with it in the end. Edited 1 time(s). Last edit at 2018:05:14:17:03:21 by AG on apple. Can’t criticize our efforts in any way, but the pitch issue is somewhat troubling. 938 -14 across the last two innings does not make a happy situation. If we produce this type of strip, it will make life very difficult for us as the season progresses. With hindsight it would seem that Craig's failure to hang on to what would have been a blinding catch yesterday evening was pretty decisive. What a rotten shame - though Jack's presence in the attack on the last day wouldn't have done any harm. As Hants dropped James early on and were bereft of Abbott for much of Somerset's innings I guess things more or less evened out. An even rottener shame for Jack to get injured, during such an apparently innocuous exercise as fielding practice, just in time to rule him out of the first Test. Whoever gets picked instead will presumably then be regarded as the man in possession unless he does a Kerrigan. While today was not the most inspiring day's cricket I have seen, I felt Somerset stuck to their guns well in dispiriting circumstances, Tom showed an appealing willingness to try alternative tactics (even if on the day none of them worked) and Eddie Byrom could develop into quite a useful leg-spinner with a bit of practice (in not bowling long-hops). This was just the kind of day when a fully-fit Jamie might have been explosive (or, alternatively, expensive). Does anyone know why George Bartlett stopped bowling after two balls of an over? Presumably not for intimidatory tactics. Please tell me he's not injured too? The trouble with producing result spinning pitches is that all the cyderbad pitches have probably been normalised. I don`t recall Jim Laker, or Tony Lock, of Derek Underwood or Ray Illingworth ever breaking a thumb (or indeed any other part of their anatomy) in pre-match training. And they played in at least twice as many county championship matches a season, let alone Tests into the bargain. Who knew best - cricketers and their mentors then, or cricketers and their mentors now? On the other hand, how many bowlers were much good at fielding in their day? So CJM? What are you suggesting? Surely it is just as likely to injure oneself in practice as in actual match play. Did we not win? I was informed on here last night it was a done deal. Someone must be suicidal !! Far from suicidal for sure! At 11am April 20 would any of us not taken 2 wins 2 draws and 63 points from your opening block of 4 games? We were superb today. On a sunny day flat track we stuck to it brilliantly and losing the countrys best spinner in the warm up. Credit where its due, i didnt think Vince had it in him to play innings like that. We had no luck today either. Tim & Lewis were all.over RR after lunch. If we'd have got a nick there at a net 0/5 with 60 overs left it could have opened up for us. I make no apologies for supporting my team and being positive of our chances. Given the criticism the batters & more so Tom got last early season how much better has this start been!? I make it 6 hundreds 2 x 90's & 2 x 80's already. We look like a real.team and happy camp. Forth and final day of the match photos. I will not describe it, but zzzzzzzzzzz sorry did I fall asleep. It's was a match where if there should have been any luck going around none of it went Somerset's way. James Vince off Dom Bess the ball didn't carry to the fielder. Hashim Amla the fielder tried to catch the ball but it was out of reach, all he got was a mouth full of dirt. This looked like a good catch by Craig Overton to dismiss Tom Alsop off the bowling of Tim Groenewald. The crowd all the players thought it was out but not the umpire didn't. Rilee Rossouw, once again the crowd and both Overton's and I expect Tim Groenewald thought this was out. But umpire didn't. The pressure was on for Rilee Rossouw with fielders around the bat. We did gain four new spectators today two police lady jockey's and their horses. It is not in me to gloat about something that I hold very dear, but spending a day yesterday watching the run fest led me to think that sadly today could be yet another repeat. It had 'drawn game' written all over it yesterday afternoon, and so it transpired. I am sure that we gave 100%, I am sure that Hants' batters were as good as ours were yesterday, but the 8 - day old pitch killed the game. "Taunton is killing cricket" - now where have I heard that before? Final word from me on this game. 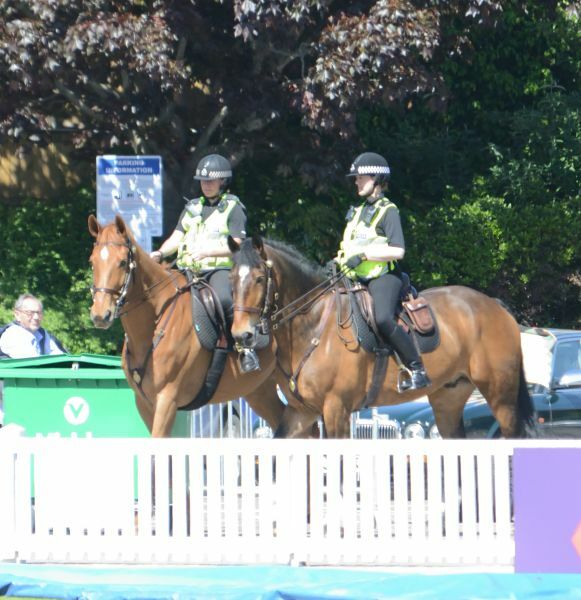 "Police jockeys", I have heard it all now, but thanks for the photos Mike. As someone said earlier, when you resort to dead pitches like this you need either someone of sheer pace, or perhaps a wrist spinner when your regular spinners can't get much help from it. Our attack does well at times on helpful pitches, but has too much sameness about it without much variety. Still we didn't lose and are better placed in the Championship than we were last year, but looking at the fixture list, where is the next win coming from. I want to see results, not boring draws. If only we had someone who can bowl 90mph at will fully fit and just ready to return! I've been saying for months how crucial Jamie is to our red ball team. The bowling group have been superb this season and got the 2 wins in April with little fuss. But up at Lancs and then this game we were crying out for Jamie as an option. Edited 1 time(s). Last edit at 2018:05:14:20:07:21 by wsm fan. Back to Ciderabad, or at least a nearby suburb, please. Edited 1 time(s). Last edit at 2018:05:14:20:31:43 by AGod. Not if it had come by lunchtime today as if we'd got Vince under 100 & into 7/8/9 by lunch it would have been all over in plenty of time to chase any target. WSM, where have you been? 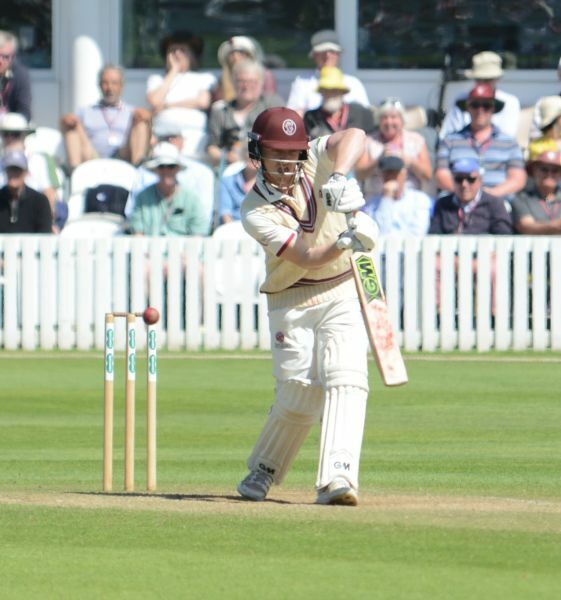 Jamie Overton made his Somerset debut in 2012, which makes this his 7th season with the club. During that time he has appeared in 44 Championship matches (6 per season) and taken 98 wickets. These have come at a cost of 36 runs apiece and include just 2 Fifers. You see great potential still to come. My hopes of that dissipated a while ago. When I was last at the County Ground a member said to me that he may well have to give up the game sooner rather than later. I don’t wish that on him, but patience can only be tolerated for a given period of time. Will 2018 be his breakthrough year? I don’t think so, but you clearly do and there we must agree to differ. As a club we need to still keep looking, not just pinning our hopes on one individual. Well, everyone's looking Tom (for express bowlers that can bowl straight, that is) among the counties. Well a new contract signed last August until 2020 presumably slightly above minimum wage! suggests the club also think he has something to offer. As knowledgable as i am (and yourself too clearly) maybe just maybe those employeeing him know more than us both put together. Unless of course you have the coaching qualifications & experience needed to run a county cricket club? As to having to give up the game soon, seriously where do you get this rubbish. I took the opportunity to say hello to him on Friday lunchtime (as i suggested you did) and he said fully fit & it was coming out well. He is desperate to get back on the pitch & contribute to the team. Whether extreme pace would have made any difference is debatable. Fidel Edwards for Hants was steaming in yesterday to very little effect. I watched a few overs of his from the viewing area below the Press Box & he looked pretty lively ! I've no idea how much faster Jove would/could be ? This was a fixture Hampshire won last season and it's a measure of the struggles that we didn't look remotely like doing likewise this time. The injuries are mounting: Northeast, Crane, Dawson and now Abbott. I have never bought this hard luck story: good teams, as they say, make their own luck. For once, Hampshire's feeble batting held firm. I suppose every dog has its day- no thanks to the openers' for their dismal dismissals. The pitch allied to some rare resolution conspired to snuff out Somerset. I suspect Vince is safe for the First Test- some aren't so sure- but someone who can't average more than 30 in Division 1, is unlikely to average 40 in Test cricket. Even with an embyonic table, it has an ominous look about it: Hants and Worcestershire propping it up. It's great that we have these bunches of 'members' we meet at the ground with seemingly fundamental expertise about the future of fast bowlers there to act as expert witnesses and willing to solve all our problems by just telling us what the solution is during a chat. And there you were Tom to report it to us in your usual ( it seems) 'objective' way. I think, Grizzly, the answer is that Jamie cannot really bowl any quicker than Fidel Edwards. Of course, he's a different style of bowler though (high, over the top action from a tall man, vs skiddy/slingy action of Fidel). I think the answer is that high pace, in and of itself, would not have been enough on this pudding of a pitch. To win on that, a team would need at least one world-class pace bowler and, very possibly, a world-class wrist-spinner to boot. If we'd had Joel Garner and Mushtaq, each at their best, there's every chance that we would have won. The only bowler currently on the county circuit (albeit yet to debut) that I think may have made a difference would have been Morne Morkel. Guys like him or his erstwhile teammate, Kagiso Rabada, or of course Dale Steyn at his best... to overcome a pitch like that you need both high speed AND very high skill level. The vast majority of English pitches conspire against genuinely quick bowlers. North Marine Road (Scarborough) is one that often suits them. And Old Trafford certainly used to, but less so these days. Beyond that, it's slim pickings, it really is. Pitches have gone the same way all over the world. Fidel Edwards' Test debut was on a lightning surface at Sabina Park, where he took a five-for, with the W Indies crushing Sri Lanka. Unfortunately for Edwards, nobody in Jamaica could be bothered to preserve pitches like that, and his international career fell away (along with the W Indies as a force to be feared). It's one reason I've loved watching Fiddy over the weekend, even on this dying wicket at Taunton: he's one of the last, tenuous links with a lost world. Brian Lara was his captain for that debut in Jamaica, with Chris Gayle opening the batting. In retrospect it turned out to be just about the very last sight of those great, exciting W Indies teams. There was just a glimpse of that magic in his first over from the River End. Nothing had been happening for him from the Church End, and he'd been mooching around on the long leg boundary looking thoroughly miserable. Then suddenly there was that unplayable rocket to dismiss Byrom, the trademark "you-didn't-even-see-that-one" celebration, and an over of fire and ferocity. Great stuff. Well yes Grockle, when you attend the ground and do not have to rely on watching a streaming service from millions of miles away, you get the opportunity to discuss what is going on with other members. Said member was expressing his opinion based on Overton, J's poor record of fitness as well you understand. In that the club cannot go on retaining the services of such an absentee ad nauseum, he should have to accept that his body is simply not up to the demands of a professional cricketer. Contract, or no contract, such a fate has befallen others in the past and it will again. That should be easy enough for anyone to understand. EDIT Removal of pointless quote from post two above. Please use the quote facility only if the post is on a different page or you want to selectively refer to a part of a quote from another poster. Just repeating the post in quotes simply increase the size of a thread and makes longer threads more difficult for mobile users to access. Edited 1 time(s). Last edit at 2018:05:15:04:41:23 by Grockle. It was such a sad sight yesterday watching Jamie going around the ground in his wheelchair, I really hope he's at least able to walk properly soon. As the topic was about the 'objectivity' of reports about a player who, please correct me if I'm wrong. hasn't bowled a ball in anger in a game at Taunton during this season, I am wondering how my location has anything to do with it. Most of us take your point about Jamie's injury record (though we may post it in less aggressive tones rather than as if it was the player's fault) and again, I am not sure what a Botham Stand supporting resident has relating to the long term issue (due to their attendance at games in 2018) that anyone else would not have. We are all a 'million miles... away' from it if we don't have facts. But you go further than that and give us the member's assessment of the present situation 'body not up to the demands of professional cricket' as if that's it and the solution is get rid of Jamie Overton. That's not 'objective'. That is a subjective opinion by a person I assume is NOT an expert on the 'demands of professional cricket' or what Jamie's body is 'up to' and who does not have access to any more information than the rest, present or virtual. I have been away a while but I doubt the club have set up a 'medical expert think tank' in the Botham Stand and given membership to people capable of having professional opinions on the situation while I've been away. So the 'I've had a chat with a member and the solution is.....' stance is not objective posting. We all talk in this virtual Taunton. We have had our virtual experience enhanced this year by some visuals but that does not provide off field info (can't even see the boundary). However we can talk to people on the boundary and get their subjective input and we can all get facts that offer objective slants to the subject matter. So your 'you're not here so you don't know' view is less and less valid year by year and irrelevant to this present issue. And as far as I am aware there is nowhere in the supporting sections of the County Ground where the 'font of all knowledge' has been set up and I am damn sure it is not within 20 feet of where you watch from Thomas. Please post your opinions and that of others but don't spout how you always post 'objectively' and then give us this guff. It's a personal opinion of someone you talked to and unless you can relate it to observable and verifiable fact that is all it is. As far as I know, Jamie is bowling, as far as I know he is being considered for a comeback during the one day games, as far as I know he is fit. I think some of that can be verified from sources in the know but I can't be sure so it is still my assessment and nothing more than that. See how it is done? You are right when you say it should be easy for anyone to understand. Why don't you seem to understand it then? This isn't the first time we have had this conversation and the difference between 'subjectivity and'objectivity' still seems to elude you. Edited 4 time(s). Last edit at 2018:05:15:06:32:16 by Grockle. Bloke with Dog - I agree completely about Fidel - I really enjoyed watching him perform. Attended all 4 days in good weather . Met some good people and some good cricket too. 1 . We gave up the ghost at 3.30 when Byrom came on . I get why we did that as we probably didn’t want to over bowl the bowlers this early in season and wicket was dead. So Kerr saying boys have given everything is only true to a point . 2. Last hour will drive people away from the game . Bartlett’ s 2 Beamers say it all . Hurry etc need to look at that type of wicket as I think we need to win 2 more home games and 3 away to have a realistic chance. Did anyone think that Bartlett actually got Vince out caught by abell but it was a no ball ? Or was it bump ball . Thought by Bartlett’s reaction it was a catch. Overall a good start but we need freshened up and trego myburgh vdm etc will give us that at the weekend!!! Hopefully we keep good run going. Whose clever idea was it for Leach to be practising his batting instead of his bowling yesterday morning? He wasn't going to bat under any circumstances yeaterday, and he had a whole month free to practise it before it would be required again by Somerset. 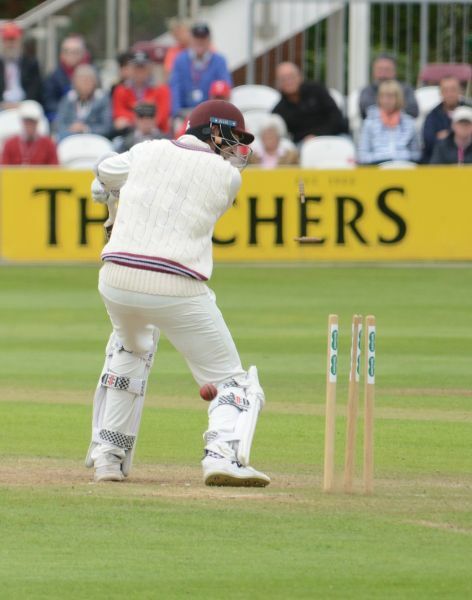 Leach was practising his batting in the Taunton nets before the start of the final day of Somerset’s match against Hampshire when he was hit by a ball bowled with a sidearm ball-thrower by the Somerset head coach Jason Kerr. I'd have offered odds of Headingley vs the Aussies proportions (500/1) against Jack being forced to bat for SCCC yesterday. Hants01, I'd say that Worcestershire are propping up the table. The gap between Hampshire in 7th and 4th placed Essex is just eight points. I realise that you're not very optimistic about your team this year (echoing my feelings about my beloved Somerset last year!) but it's too early to start hammering the nails in the coffin. Amla is a class player and it's just possible that Vince could surprise you!! As a Somerset fan I'm much more content than this time last year. We'd have all been happy with two wins, two draws at this stage, though the injuries to Davey, Tres and Leach are disappointing, especially how the last one happened. As for the Taunton wicket, I suspect we're a little hamstrung by the worry of a points deduction after the events of last year. I'd love to see turning wickets, even with just Bess in the line-up. The most pleasing thing is that all of our players have achieved something. Yes, we always want all our bowlers and batsmen to hit form at the same time, but our bowlers have worked well as a team, our top of order have hit centuries, and we have batted deep when called upon. The fact that our number 11 has a batting average of 18.7, and Overton, Bess and Leach can all bat is very reassuring. The days of rabbits like Allan Jones (average 5.39!) and Bob Clapp (4.45!!) for example, seem a lifetime ago. I suppose they are. But this is one way in which cricket has changed over the years. We need to find the testicular fortitude to not be scared off by a possible points deduction We must remind ourselves that only once in two years did we fall foul of a 'below average,' mark and that in a game where we probably pulled out extra stops to ensure that the track would turn. Bottom line: We won't win any games on pitches like yesterday's unless there is very low cloud pretty much throughout (and perhaps not even then). And we've not, generally, been particularly good at netting wins on our travels over recent years .. a few away wins spring to mind - Lord's with the Chawla ton and Meschede on fire, Trent Bridge, with Mybs hitting Tahir all over Nottingham, Edgbaston vs a poor Warks side last year, and North Marine Road, with Coverton extracting a ton of bounce (and Yorkshire losing two pacemen during the match). And one other win, at the Rose Bowl, with Cove again being the main man to do the damage. So that's five away wins that spring to my mind, but spread over 3-4 years. So they've not been a frequent occurrence. When did we last win at the Oval? Old Trafford? Headingley? Not even sure I remember a win at New Road? Last win at Chelmsford? We won by a mile at Castle Park, Colchester some 8 years ago. Okay, this year we won't be playing at the Oval, but Guildford is scarcely a strong prospect for a win. So............if we're going to win the CC, we'd better take a very heavy toll of our four remaining home games, IMO. I think we'd need to win three of them and pick up an away win somewhere to have any real shot at all at winning the CC (giving us six wins from 14 games). Even that would probably not be enough. But if we win, say, only one of our four remaining home games due their being played on flat tracks? We'd have no chance of winning the CC unless we were go on an uncharacteristic winning streak away from home. Edited 1 time(s). Last edit at 2018:05:15:15:15:10 by AG on apple. I Think that one of the problems with the Hants track is that too much grass was left on it - specifically that the grass was left on right up to a full (seamer's) length. What little turn there was on the first three days came from a very, very full length (from balls landing beyond the grass) and, even for a spinner, these balls were arguably slightly too full. If they're going to leave lots of grass on next time, I think they need to end the grass covering just back of a good length for the seamer, such that a spinner will be able to land the ball on a grassless area, without it being slightly too full a delivery. Just because he wasn't likely to bat yesterday doesn't mean a net wouldn't be worthwhile for a serious professional. It's not like fingers break on a regular basis in the nets. Some of you probably wouldn't let them warm up or practice at all just in case something goes wrong. Yes, unfortunately accidents happen, as Glenn McGrath would no doubt confirm. SP.. plenty of time for Jack to practice his batting at other times.. to me it would make sense for most practice to take place in between matches (or at least prior to the toss on day one)... that way, should anybody suffer any kind of injury during the practice, the team wouldn't lose a batsman or bowler *during* a match (wouldn't be reduced to ten men for all purposes other than fielding). This would also mean that the much loved (presumably) by players footy warm-up would have to be a day one, pre-toss activity only. Obviously some limbering up for the bowlers before they take the field (to reduce the risk of injury whilst on the field) makes clear sense and if some batsman (who is likely to have to bat in the match) desperately wants a hit, before the day's play, or whilst waiting to go in etc than so be it. Damn. If you'd only told them this before they started. I blame you for the injury!!! Becauae you are obviously looking to blame someone. “Well, what are you going to find to write about that,” I was asked two or three overs from the end. What indeed. The game had long since died; a string of batsmen had turned their arm over; Bartlett had bowled two ‘beamers’, although the second looped six feet over the batsman’s head and reached the keeper running on empty; and the Hampshire batsmen, Vince in particular in reaching 200, had helped themselves to some easy late runs. The day was reminiscent of those interminable fourth days in the Langer years when only two or three wickets falling on the final day of a Championship match was about par for the course. 24 fell, in total, on eight final days in 2009 and that included six in that unforgettable and successful run chase of 479 for 6 against Yorkshire. 18 in total in the other seven, all drawn, matches and none at all in a full final day against Lancashire, VVS Laxman being one of the batsmen. There were nine totals that season of over 500 including one of over 600 and one of over 700. Langer is alleged to have remarked that if Somerset wished to win the Championship something had to be done about the pitches. Well, something was done. By 2011 things had changed. In that season there was one rain affected draw at Taunton and seven positive results with only one declaration in any innings by either side in the entire season and that with nine wickets down. Of the positive results three were completed inside three days and four in four. Somerset won four and lost three of those matches. Of the wickets taken by Somerset that season at Taunton 93 fell to the pace bowlers and 26 to spin so it seems unlikely the results were due to overly spin friendly pitches. Now, I am not remotely suggesting the pitch for this match was comparable to the 2009 pitches. It was not. This pitch was much livelier on the first two and a half days of playing time, or thereabouts, than those of 2009. However, for the last day and a half it played like a throwback to those days. Too many pitches like it in the future and the Championship may remain a perpetual dream. That said the reality is Somerset need to stay within ECB guidelines if they are to avoid a points deduction in 2018. There is, therefore, likely to be an understandable reluctance to produce overly spin friendly pitches. I have no expertise whatsoever where pitches are concerned. Apart from being green or not they all look the same to me. I would not therefore wish to underestimate in any way the complexities of the situation. However, I wonder if there would be some benefit, if records are kept that far back and if it has not already been done, in looking at exactly what went into pitch preparation in, and in the lead up to, 2011 and seeing if there is anything that can be replicated now. Before the day even started there was an unbearably cruel twist of fate when Jack Leach broke his thumb in pre-match practice on the eve of being selected for his second Test. Fragments of news spread around the ground as the day progressed, each being worse than the one before, until what had happened became clear. No-one I spoke to said much other than exchanging the news. There was really nothing that could be said in such circumstances. The extent to which people felt for Leach was clear in their faces. At the start of the day I settled myself at the top of the Somerset Pavilion. It soon became apparent that Vince and Amla were settling themselves down too and were bent on survival. A glance early on from Vince off Groenewald evaded the diving glove of Davies by a foot or so. Amla edged just short of an imaginary line between slip and gully. And that was about it ahead of the new ball. Bess gently drifted the ball away from the right hander and just as gently turned it a seam’s width into the batsman. Concentration and a straight bat the only requirement to nullify any risk. Amla, whether by design or serendipity, brought up his hundred just before the new ball was due. The new ball brought little change. Amla edged short of gully and was the subject of a huge lbw appeal from Overton but that was the sum total of hope in the first half dozen overs. Overton and Gregory seemed to be getting no movement from the ball or life from the pitch. After half an hour of receding hope it became clear that the pitch would offer the bowlers no help. I decided to embark on a circumnavigation of the ground, the last resort of the desperate supporter when wickets are needed and do not come. I ambled, via several dalliances to peek at the cricket through gaps between the stands, to the spot where the old scoreboard used to be and stopped for a longer look at the cricket. Gregory dropped one short and wide and Amla, of all people, chased it into Davies gloves. 233 for 3. Hampshire 42 behind. I stopped again between the Trescothick and Somerset Stands to see if I could do any good there. An edge just short of and through where third slip would have been the most I could manage. 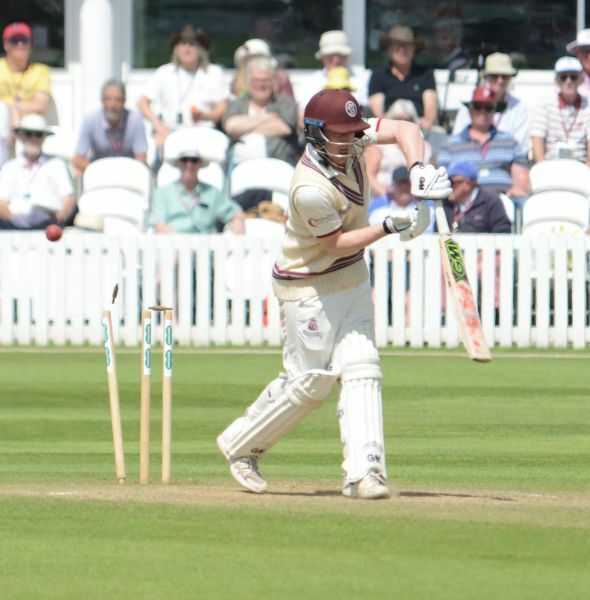 I was more successful at the gap between the Somerset Stand and Gimblett’s Hill. Alsop pulled Groenewald limply to mid wicket where stood Hildreth. Hildreth does not make mistakes with those. 256 for 4. 19 behind. That was the limit of my, and Somerset’s, success. As the day wore on, and I spoke to people, it became apparent that I was far from being the only one who had been perambulating the ground with the same intent. In fact, the route around the boundary began to look like a circular seafront promenade on a sunny bank holiday Monday. None of us believes for a moment that such things make the slightest difference but we do it anyway. Just as on the second day I found myself rooted to the seat I had intended to borrow for just a few minutes on Gimblett’s Hill when Overton’s score started to mount. Superstition may be a nonsense but it is a powerful nonsense. Back at the top of the Somerset Pavilion after Lunch it became apparent that Gregory and Groenewald had started to get appreciable movement. There seemed real hope at last. That small voice within was more doubtful, not at all certain Somerset could pull this off on such a pitch. It had been here too many times before. Hope, though, springs eternal and so I watched intently. Rossouw in particular was troubled, especially by Groenewald. A few went so close to the defensive edge they elicited gasps from the crowd, one just evading a Rossouw cut. Rossouw also edged a drive against Overton, when he returned, wide of second slip. After that the moment and the movement passed with Vince and Rossouw still there with Hampshire on 302 for 4. 27 ahead and the remaining overs starting to shrink. And there the pair of them remained, virtually untroubled, until the occasional bowlers took the match into that surreal stage of the dead draw where the game is played with no competitive edge but the niceties are observed to a fault. Not least that removal of Bartlett from the attack after his second, looping, ‘beamer’ which would have been of more danger to a passing aircraft than it was to the batsman. By then there were not many there to witness the disintegration of the match as a contest. Perhaps a thousand or so had started the day. To my eye less than 300 ended it and most of those, I imagine, might have been heard put to explain why they were still there. Something should be said about the innings of Vince and Rossouw. By the time they batted the pitch was probably among the least demanding they have ever or will ever face. However, they both batted against their natural aggressive risk-taking instincts. It was, apparently, the longest innings of Vince’s career and it suited Hampshire’s needs admirably. It must, even on that pitch, have been a monumental effort of concentration both to stay focused for so long and to so successfully contain his natural instincts. Given his England record he probably has little cause for complaint about being dropped from the squad for the first Test. However, given the likely reasons, it is a little ironic that the selectors chose to do so after an innings such as this. And so to Dom Bess. I cannot let this post pass without a reference to his being called up to the England Test squad following such a meteoric start to his first-class career. Another irony emanating from this match that he has essentially been called up to replace the injured Jack Leach. It is also a comment on Somerset’s player development and recruitment that England have been able to replace one Somerset spinner with another and Somerset still have a more than useful replacement available in Roelof van de Merwe. As I have said before Dom Bess marches towards the sound of gunfire for Somerset. I imagine he will do the same for England. And finally, where does this all leave Somerset. Second in the championship, just seven points behind the leaders, with a game in hand over them and most of the rest of the table. A start that could only be dreamed off after four games in any other year since their return to the First Division a decade ago. A considerable amount of preparatory work must have taken place in the winter to bring about such a fundamentally different start to the season and its effects may continue to be felt through the season. There are though, to use the modern parlance, challenges ahead. Winning more games on the Taunton pitch this year, now that April has gone, may be one of them if the pitch for this match were to be typical of what is to come. 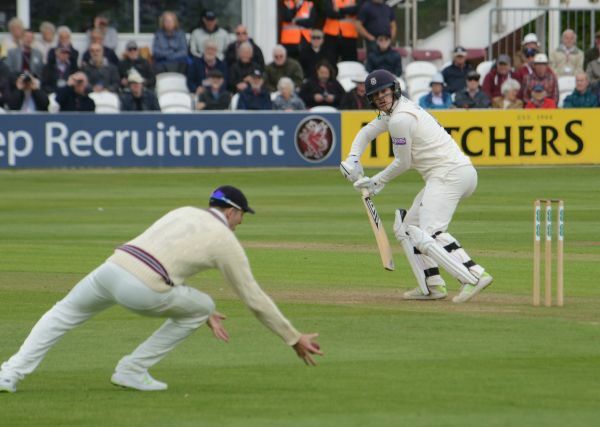 Whether it is possible to produce result pitches towards the end of the season, when three of Somerset’s remaining four home matches take place, and remain safely within ECB pitch guidelines may determine whether Somerset can sustain a Championship challenge this year. The Championship table looks healthy at present from a Somerset perspective and the team have had an outstanding start. However, the challenges ahead may be greater than those behind. The four teams Somerset have played are currently in the bottom four places in the table, albeit partly in two cases because of defeats by Somerset. The teams still to be played for the first time are currently, with Somerset, in the top four places. They include Surrey, the only team over whom Somerset do not have a game in hand, only two points behind Somerset. 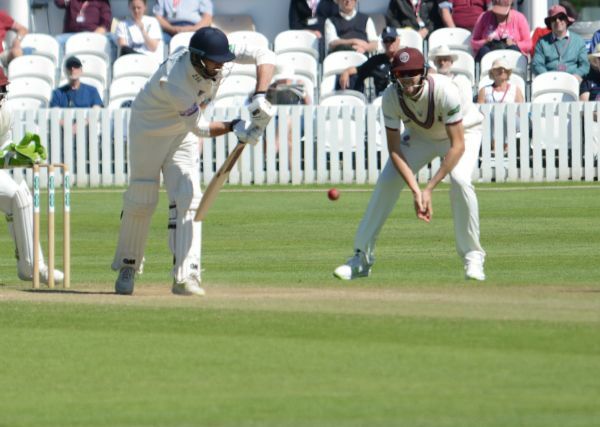 As the season progresses however depth of squads may play a role in the outcome of the season and Somerset are in a stronger position here than they have been at any time since their return to the First Division. When Somerset challenged for the Championship in 2010 the pace attack was largely carried by three players, Willoughby, Thomas and Trego who missed only one Championship game between them. Kartik, Somerset’s main spin threat that year, played only eight games. The strength of the 2018 squad has been evidenced by the fact that four injuries have been sustained over the first four games without exposing the team on the field too heavily. The ability levels within the squad too are improving year on year. After Lord’s on Tuesday the squad will probably contain four players who have played for England compared with one a year ago. That is testament to the success of Somerset having the skill and the patience to develop players internally; only recruiting externally selectively and adroitly. Further testament to, and an immense benefit of, that policy must be the cohesiveness and intensity of the team spirit shown on the field this season and at the end of last. That can play a large part in winning a Championship as Essex showed in 2017. There is much to hope and play for this season. The road to the Championship may be, as it should be, a tough one but there is no doubt that the wherewithal necessary to travel that road is coming together now for Somerset. Edited 1 time(s). Last edit at 2018:05:16:17:55:36 by Farmer White. From a Somerset perspective, perhaps the best thing about the final day was FW's excellent (as always) report. I especially enjoyed the idea of Bartlett's inadvertent lob reaching the keeper "running on empty". "That said the reality is Somerset need to stay within ECB guidelines if they are to avoid a points deduction in 2018. There is, therefore, likely to be an understandable reluctance to produce overly spin friendly pitches. I have no expertise whatsoever where pitches are concerned. Apart from being green or not they all look the same to me. I would not therefore wish to underestimate in any way the complexities of the situation. However, I wonder if there would be some benefit, if records are kept that far back and if it has not already been done, in looking at exactly what went into pitch preparation in, and in the lead up to, 2011 and seeing if there is anything that can be replicated now." It will be obvious, as you yourself said, that we're not going to win the CC on tracks like the one present on the final day here (in truth I think it did very little on day three too and I thought most of the assistance on the first two days came through the air). I maintain that, on tracks that seam a lot, Somerset are a 50:50 proposition to win, at best. Okay, we happen to be 2-0 this season but I didn't think we out-bowled Worcs but rather we won because we out-caught them. Had both sides been equally good (or equally bad) at catching, I think we would probably have lost. We've had many, many bad batting performances on seaming tracks away from home - one thinks particularly of horror shows at New Road and Headingley during the 2016 season. Also near constant defeats at CLS. We don't have an advantage, relative to most CC1 sides, in seam bowling resources. I think if we look at the home games over the past 2 years where there has been significant turn, we'd find that our record is better than 50:50 - probably significantly so because we have a, frankly, overwhelming cumulative advantage in spin bowling resources compared to your average CC1 side. "I have no expertise whatsoever where pitches are concerned. Apart from being green or not they all look the same to me." To what do we owe this sudden outpouring of modesty, AGod? A question best directed, I think, to Farmer White, given that he originally wrote it. I was simply replying to his comments. Edited 2 time(s). Last edit at 2018:05:17:15:13:22 by AG on apple. Indeed AG and Tom it was my comment in my Day 4 match report. I claim no modesty where my lack of knowledge of pitches is comcerned. Just honesty. They are a total mystery to me. Edited 1 time(s). Last edit at 2018:05:17:16:18:16 by Farmer White.